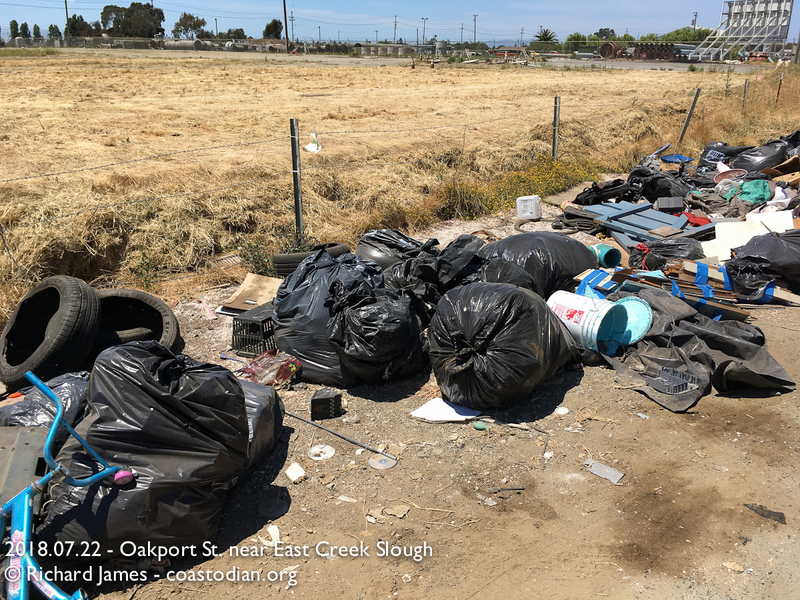 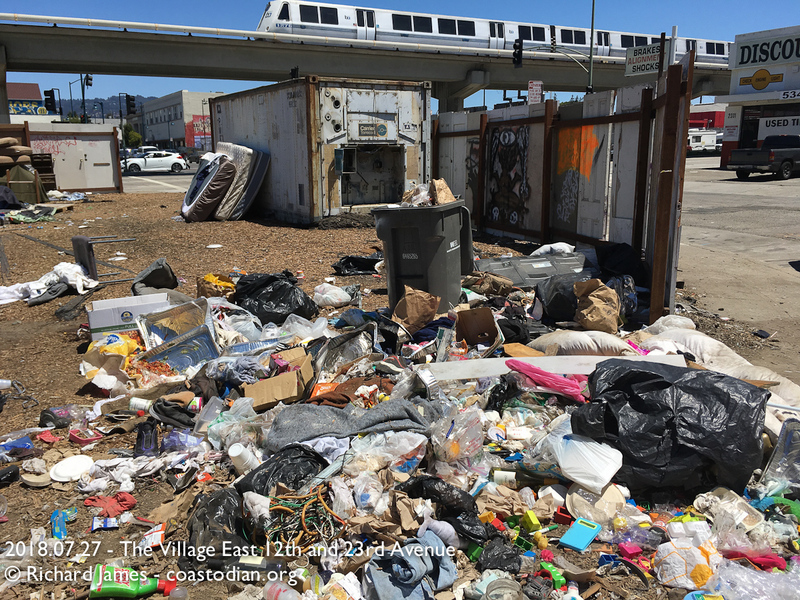 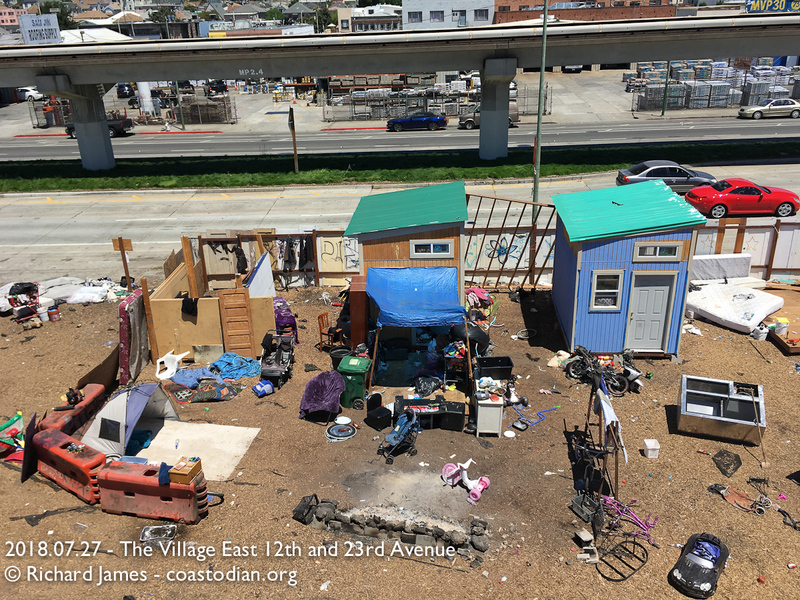 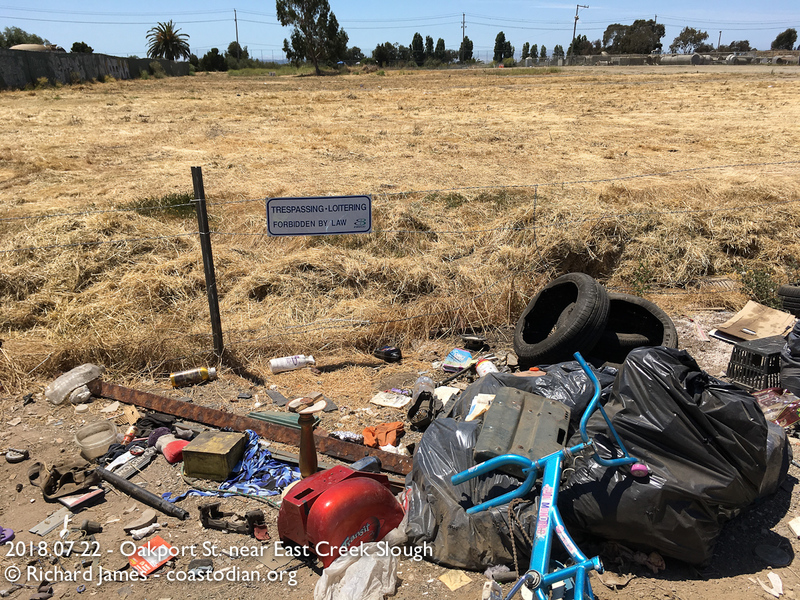 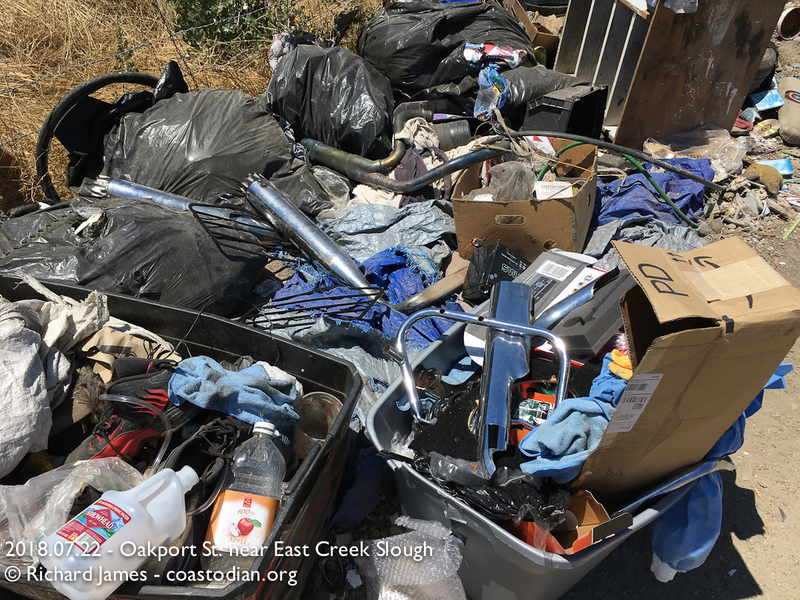 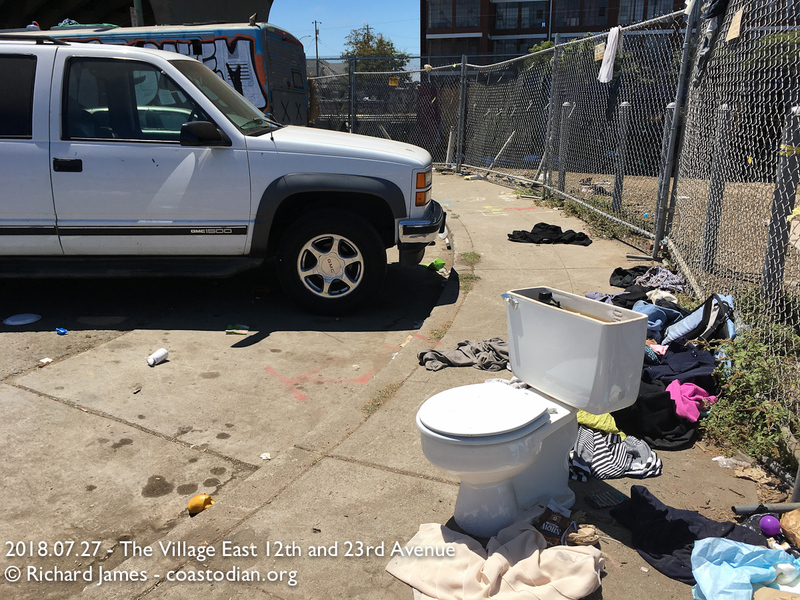 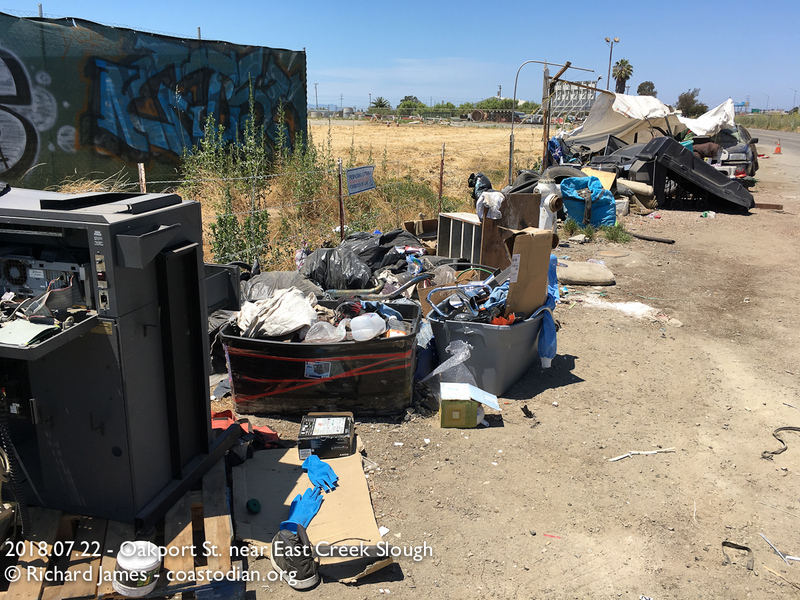 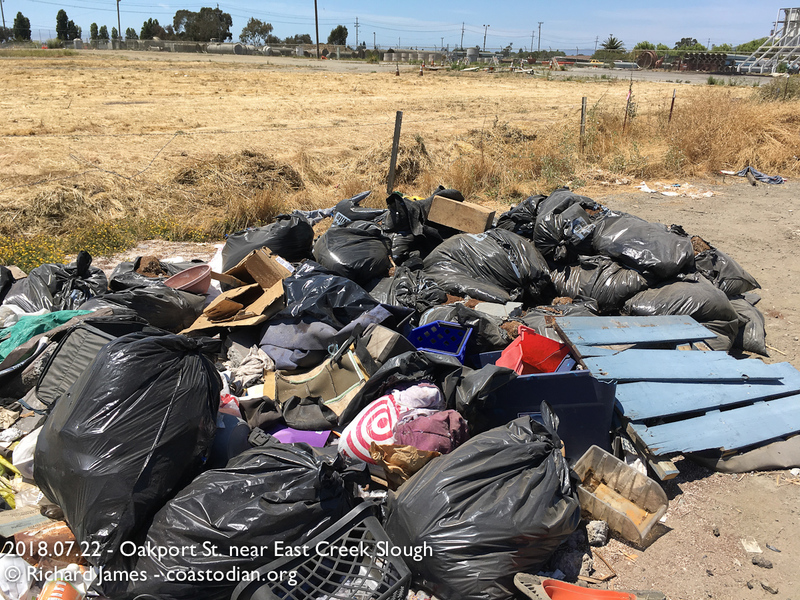 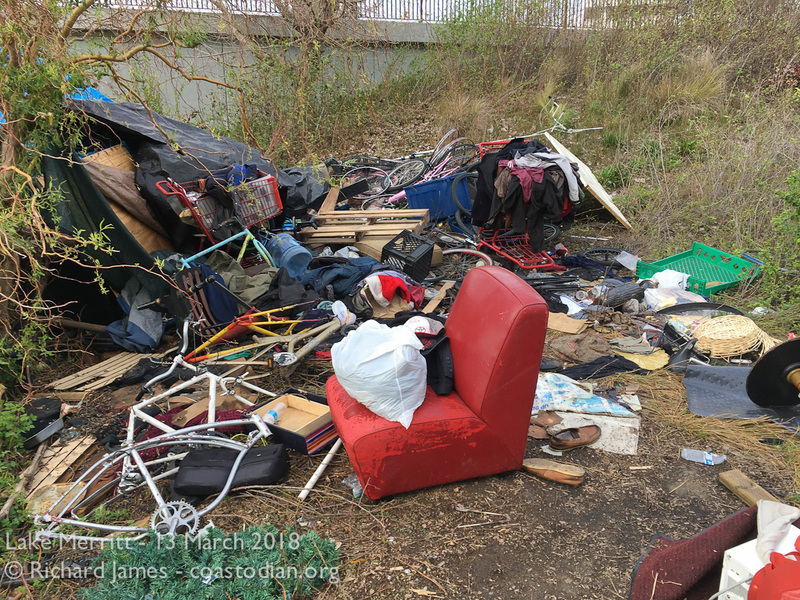 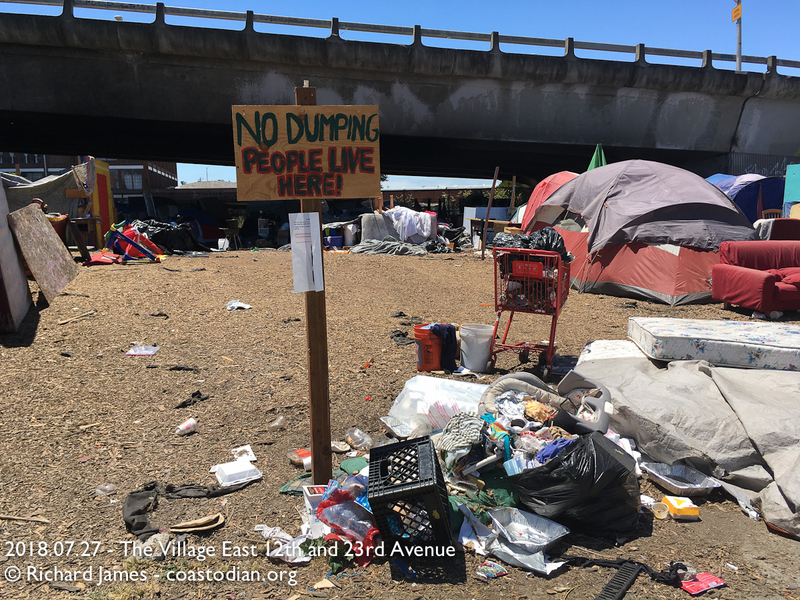 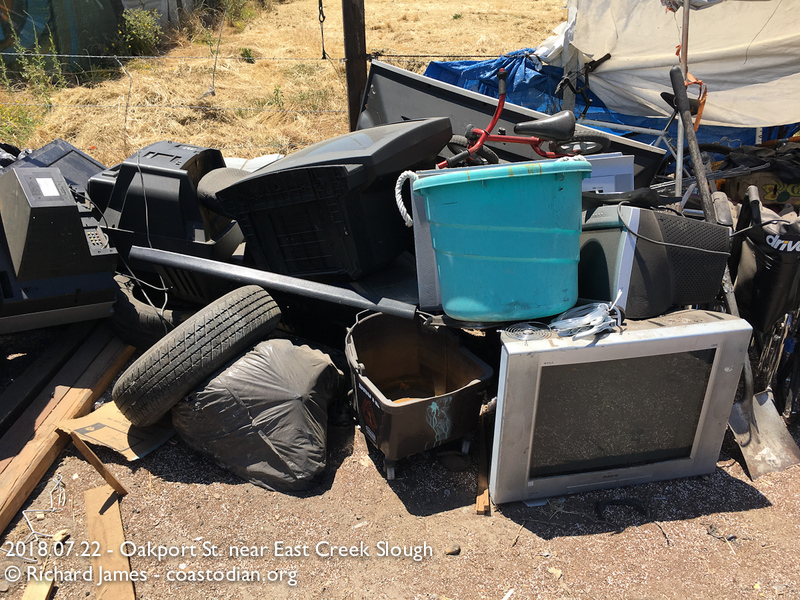 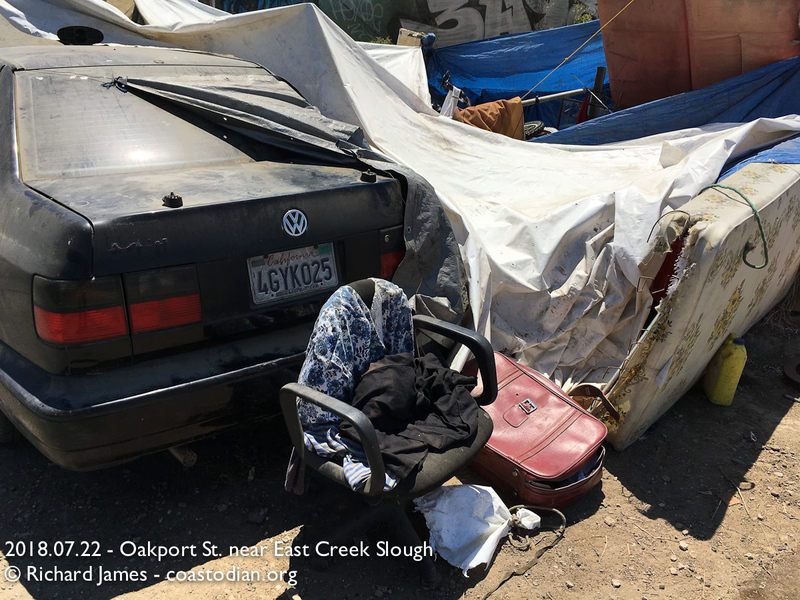 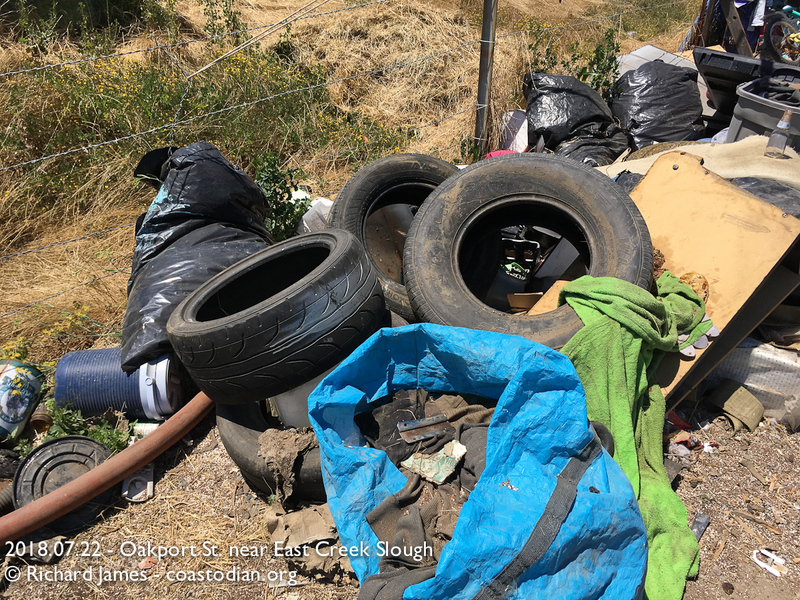 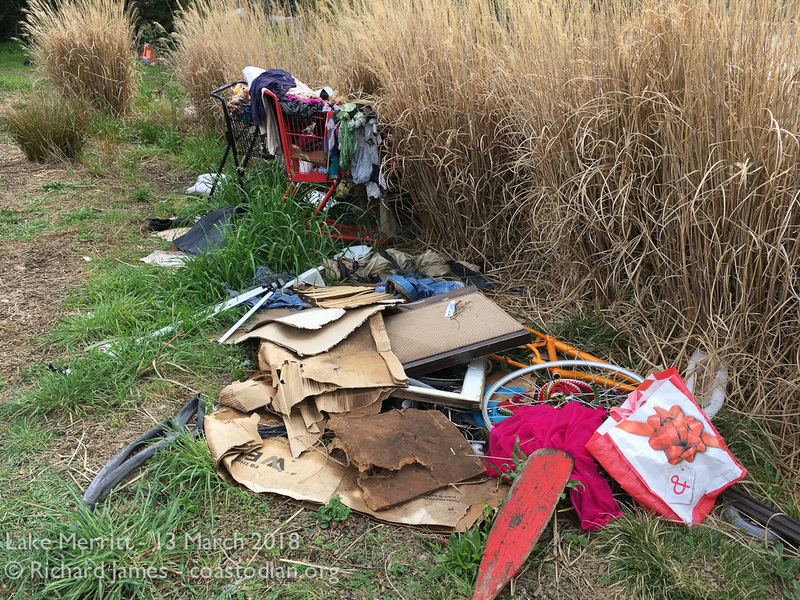 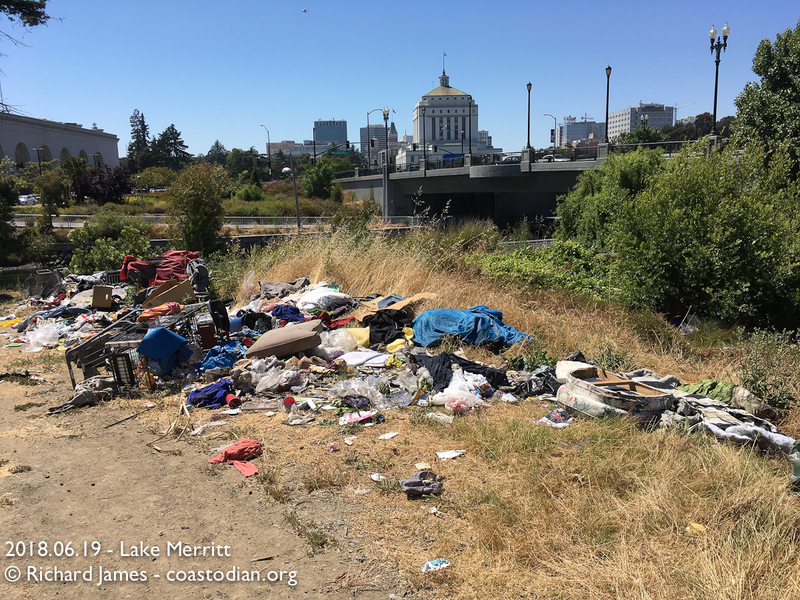 Click the words above “Impact of homeless camps and illegal dumping in Oakland CA…” to see this entire post. 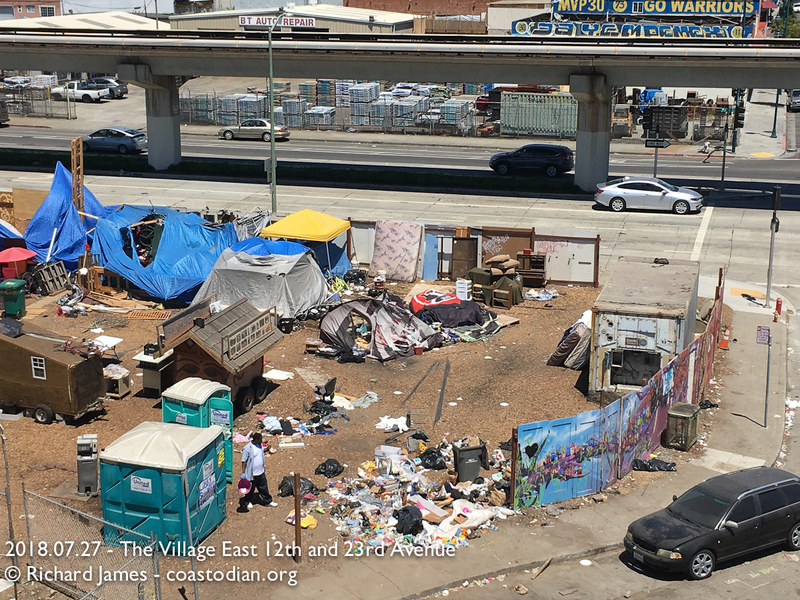 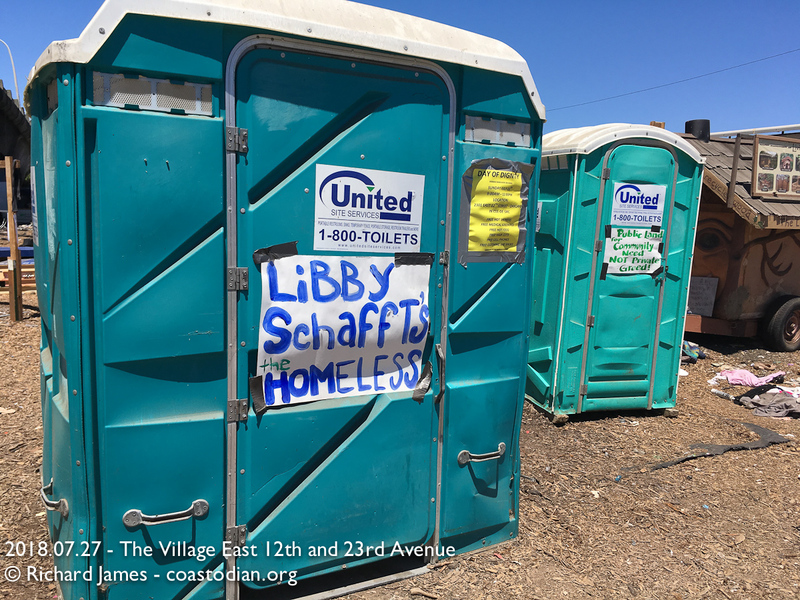 Click the words above “Impact of homeless camps…” to see this entire post. 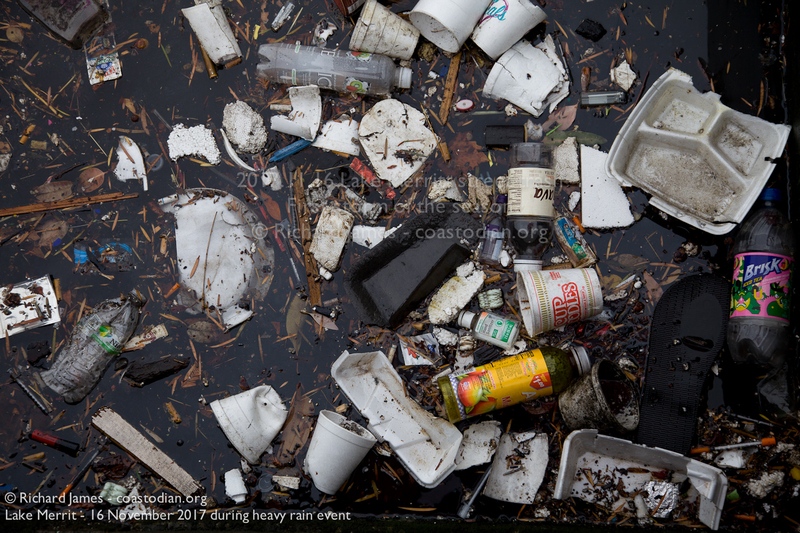 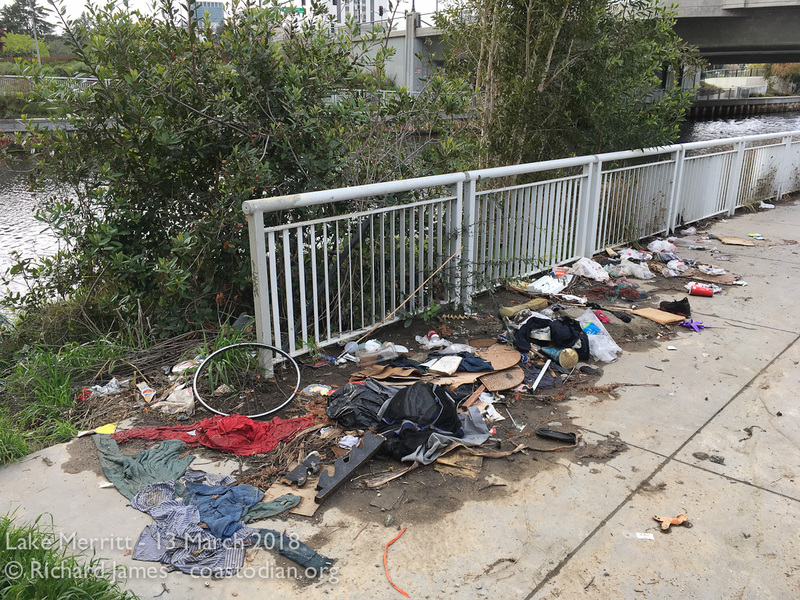 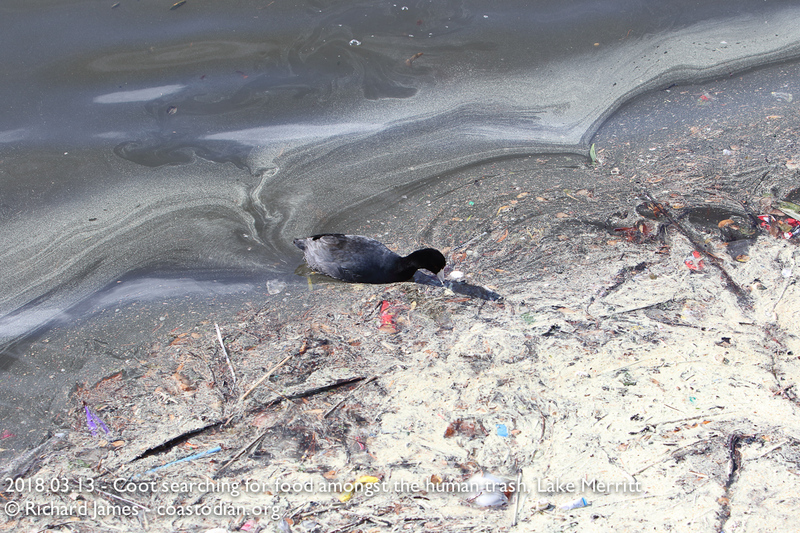 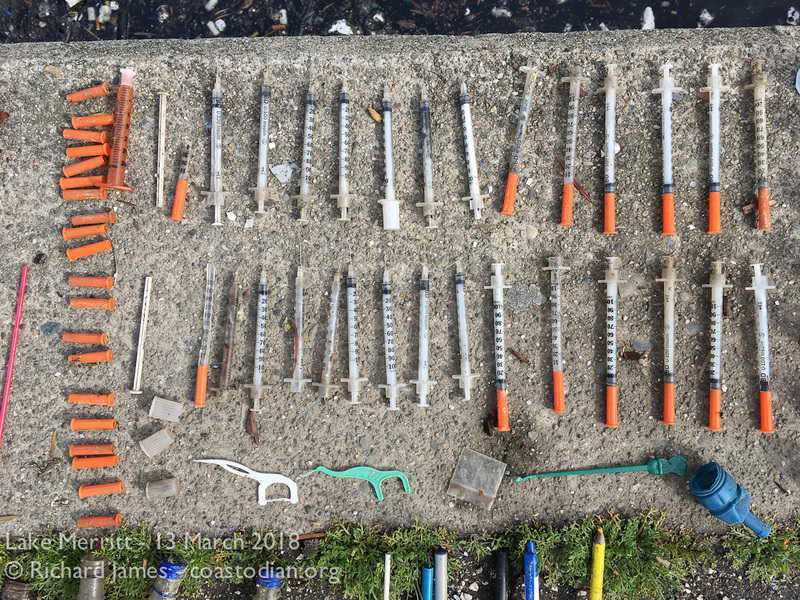 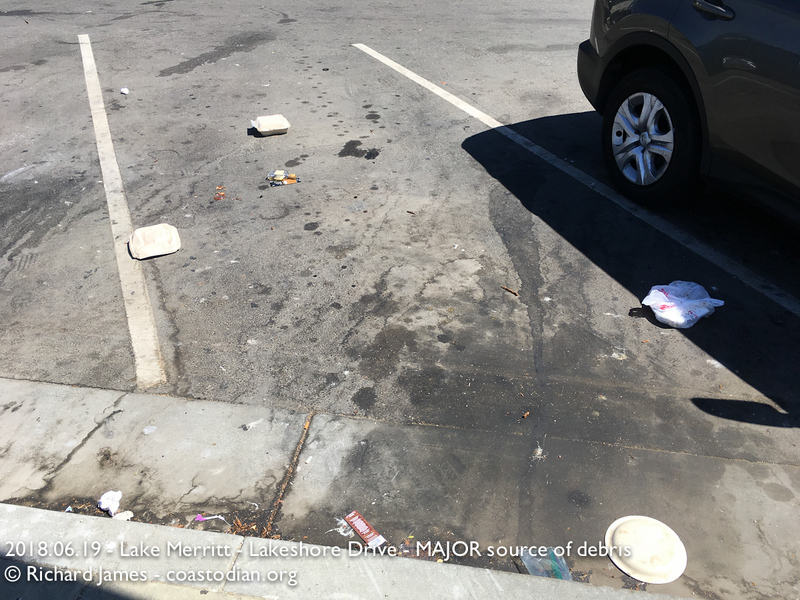 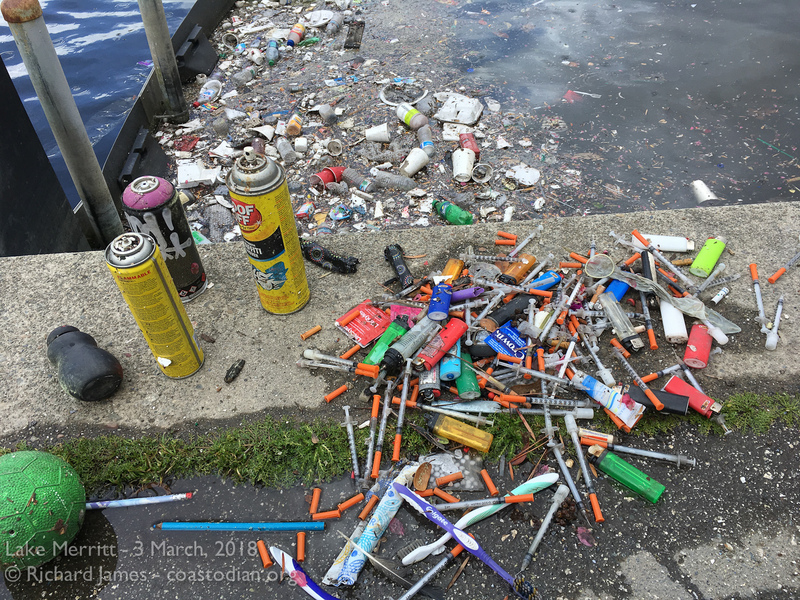 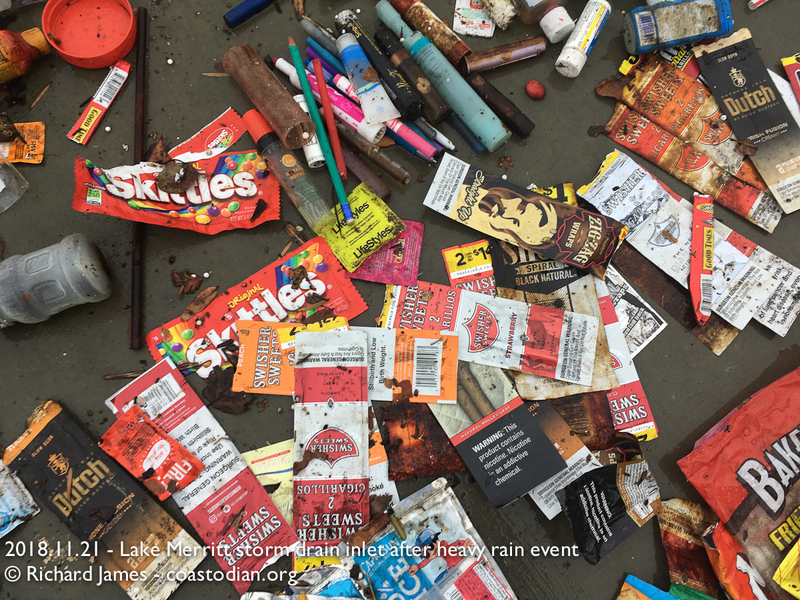 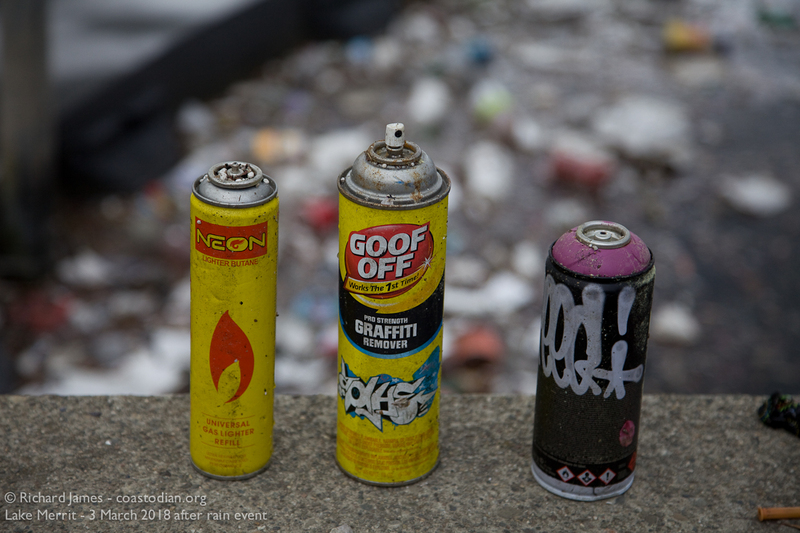 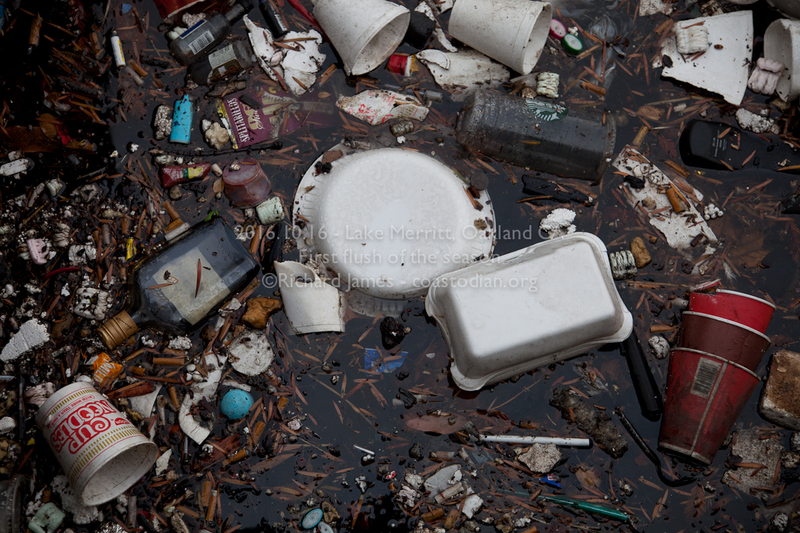 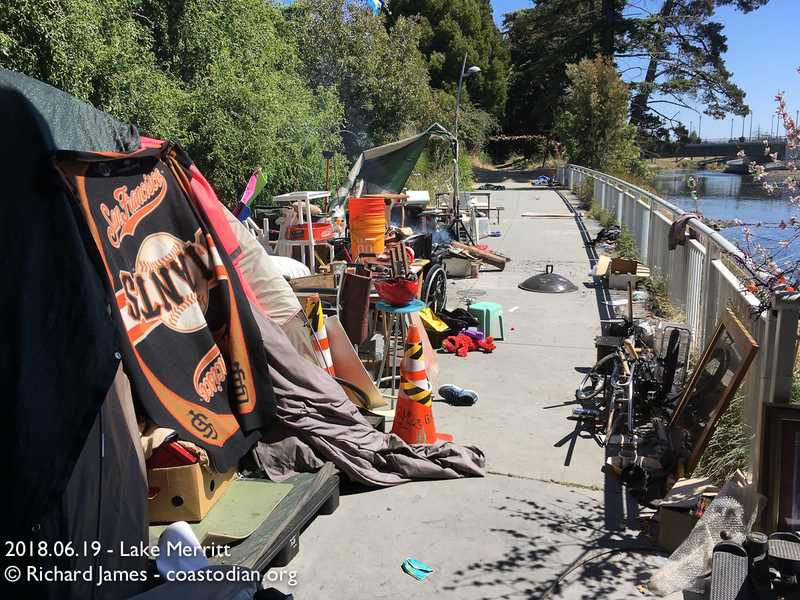 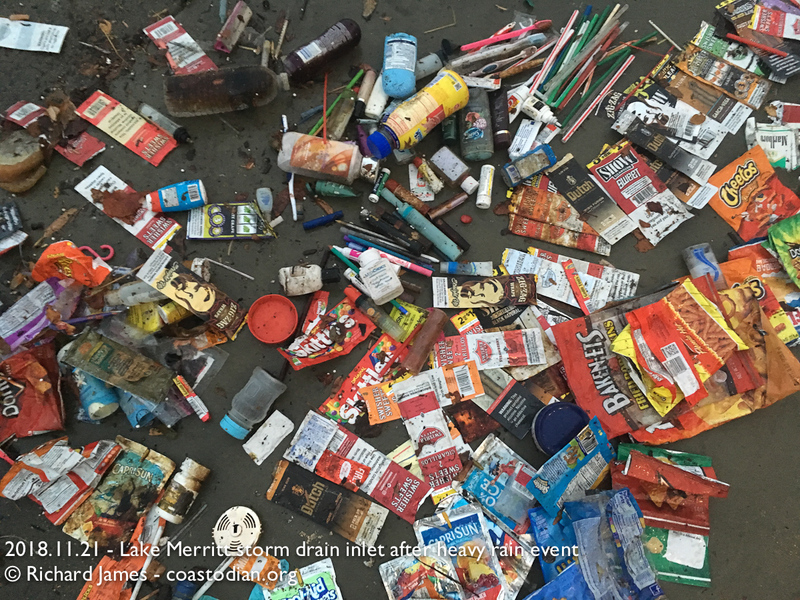 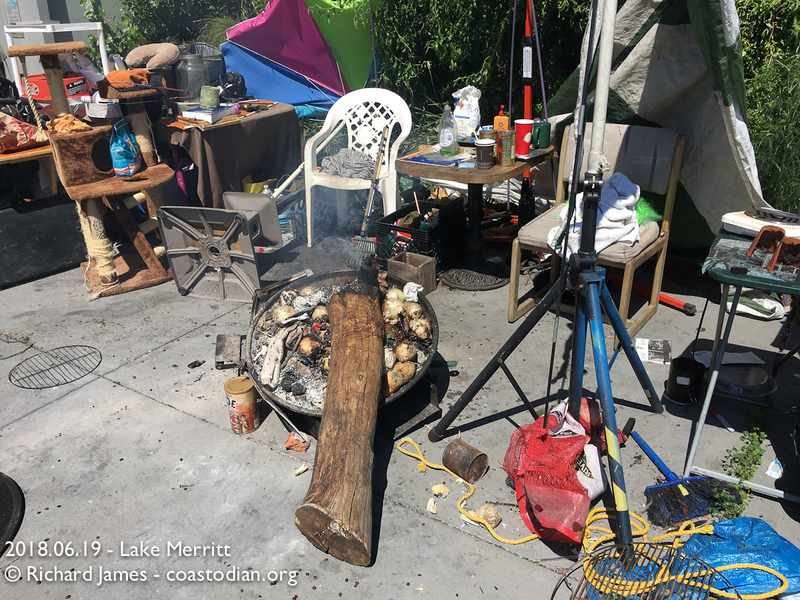 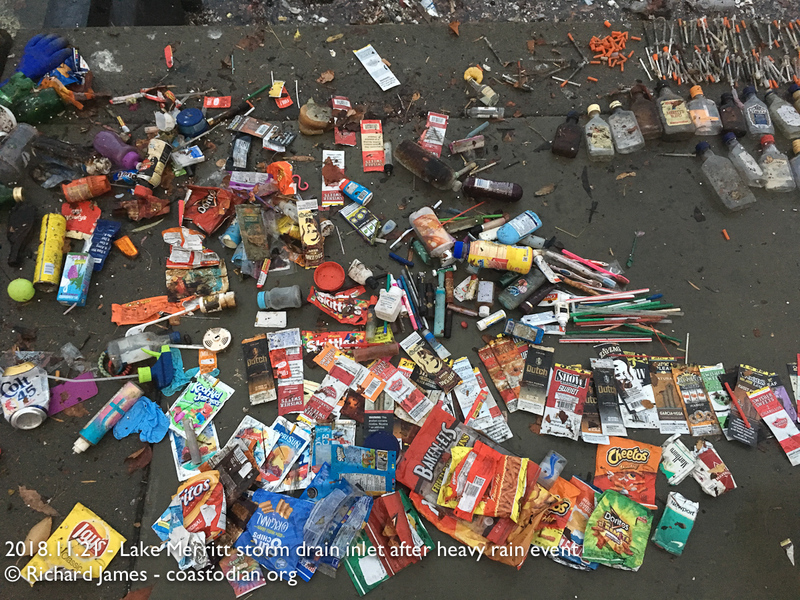 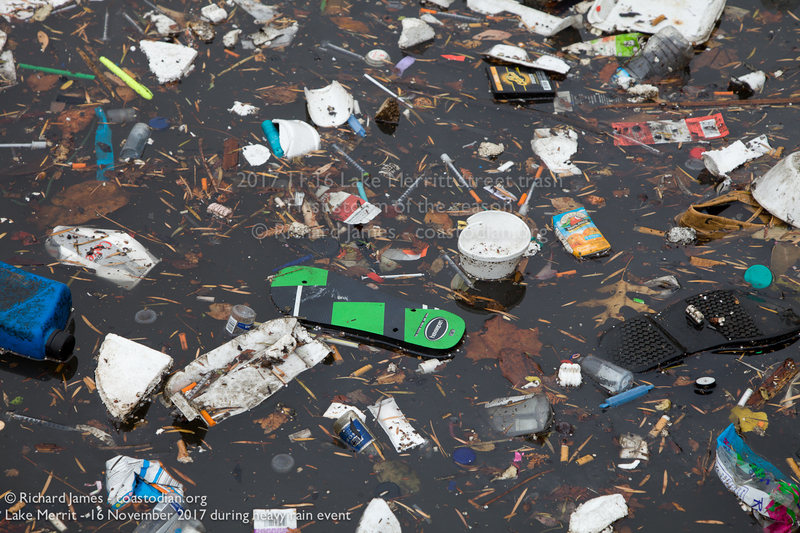 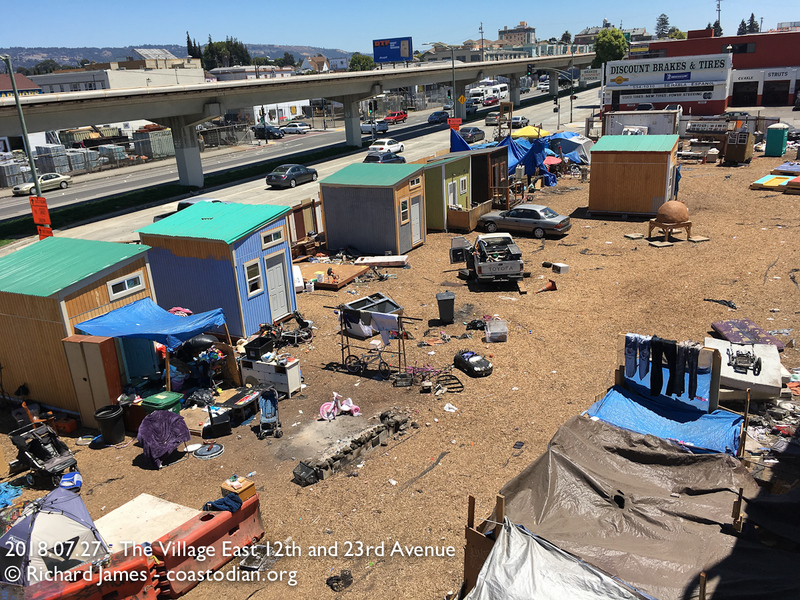 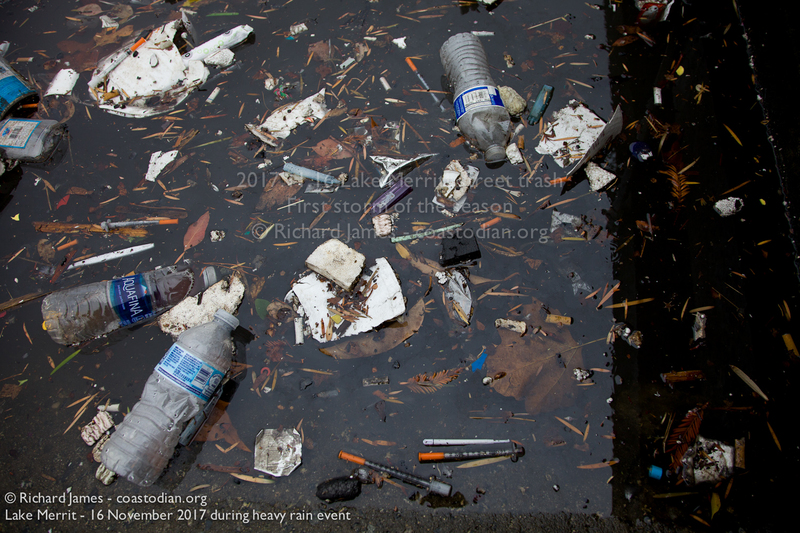 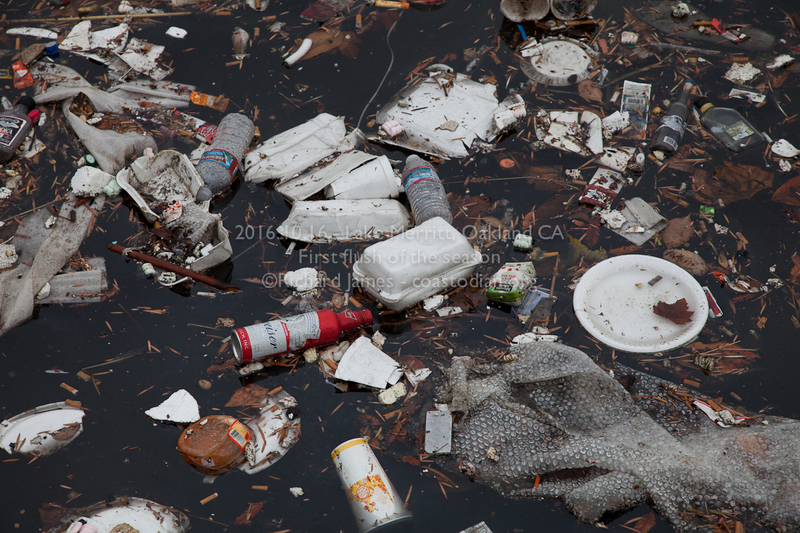 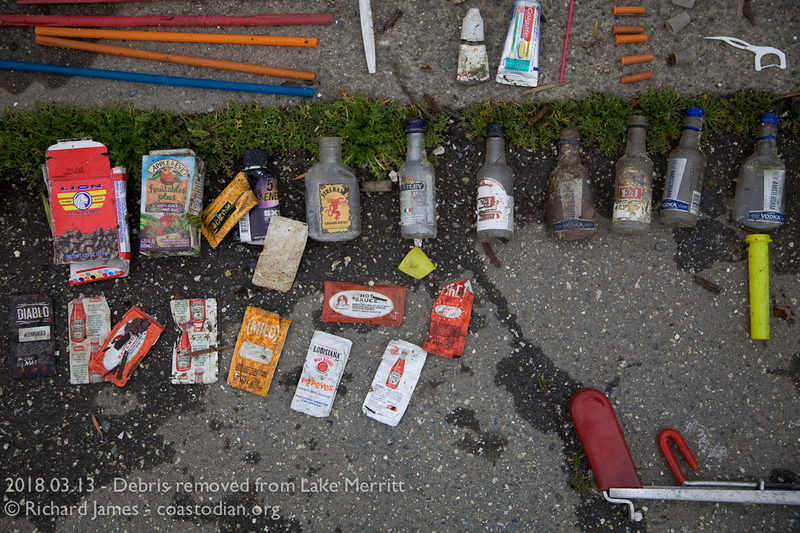 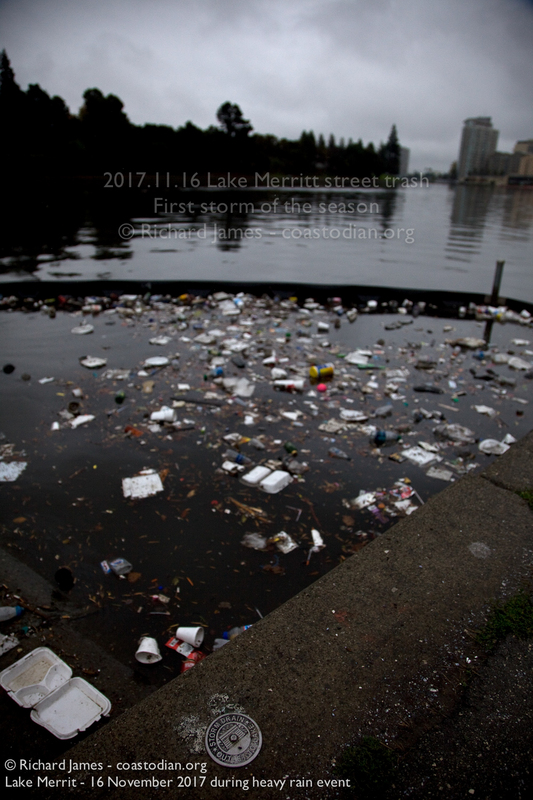 Below are images showing the huge impact on our environment from homeless living around Lake Merritt. 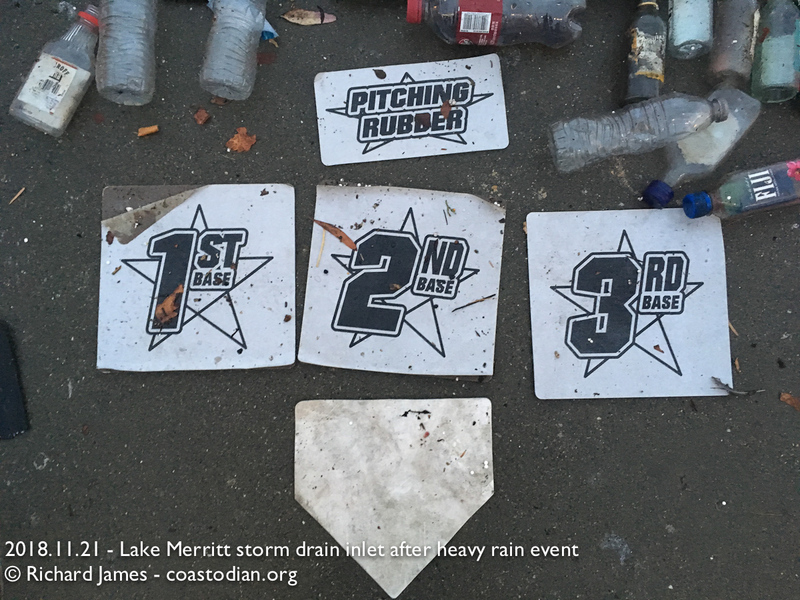 Most everything you see debris-wise in Oakland, I find washed up on the beaches of Marin, Point Reyes Seashore and elsewhere. 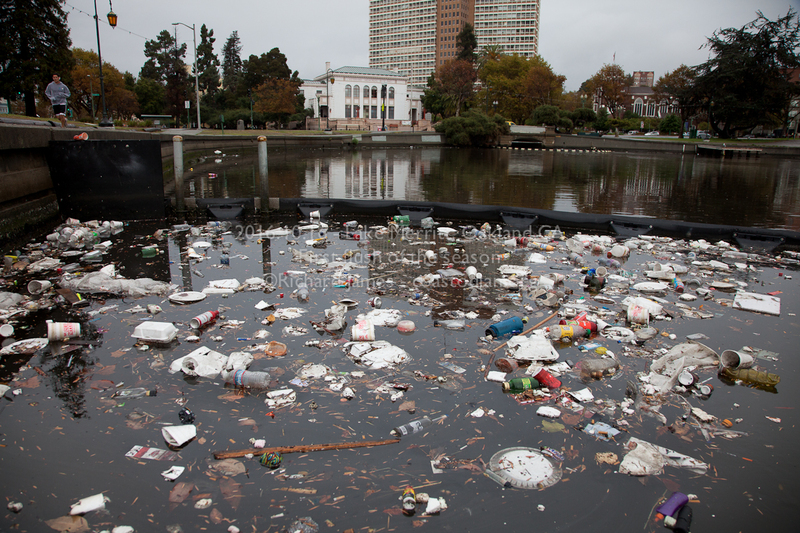 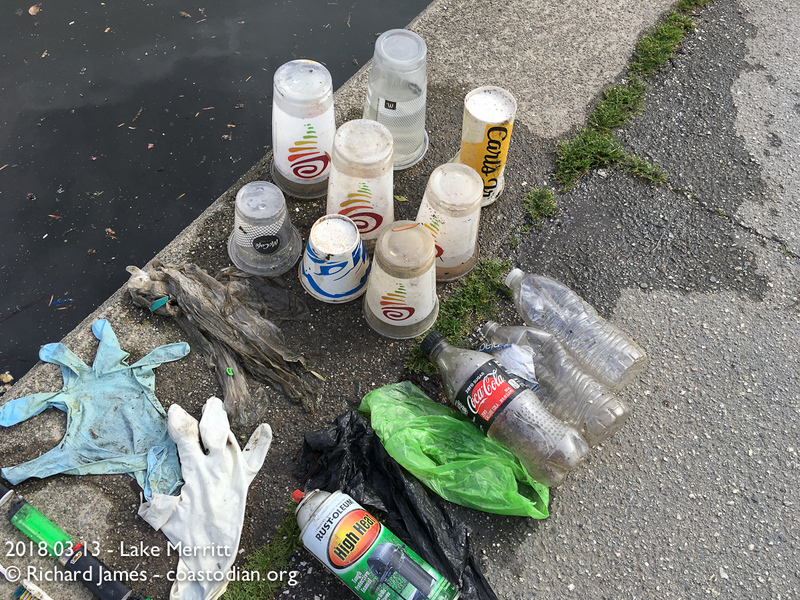 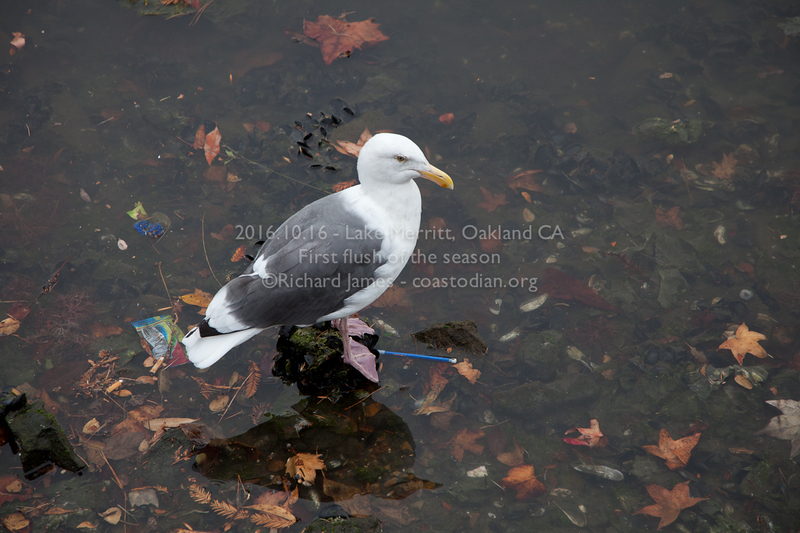 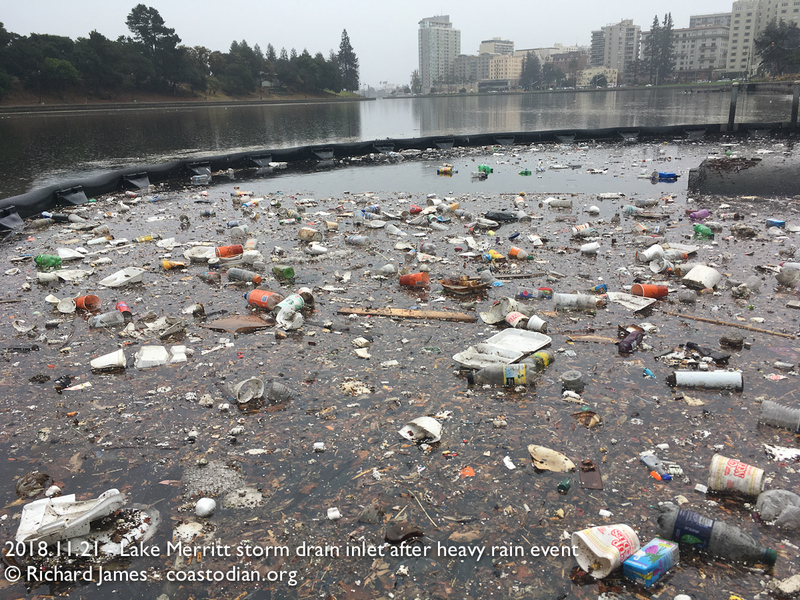 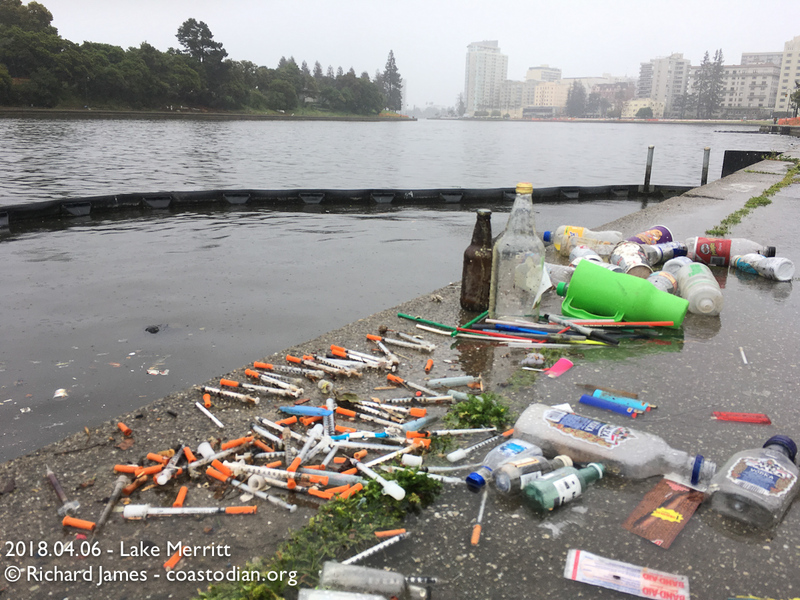 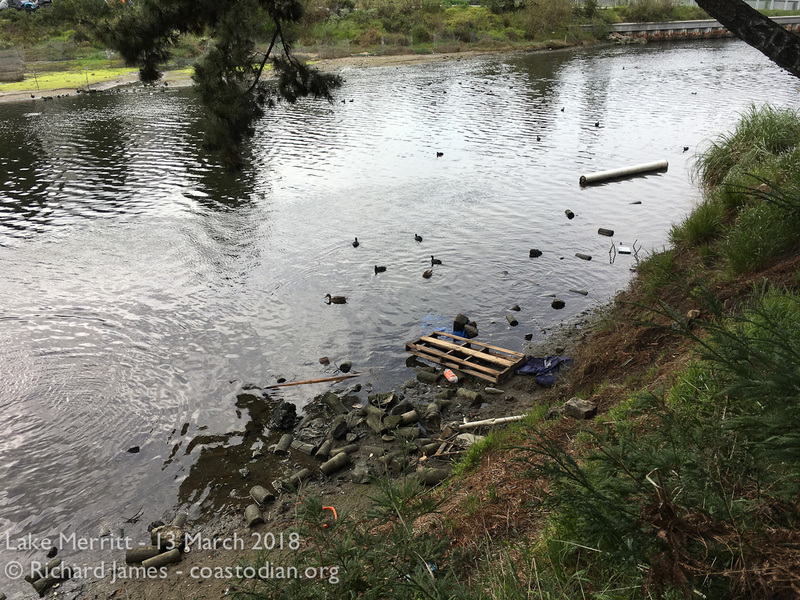 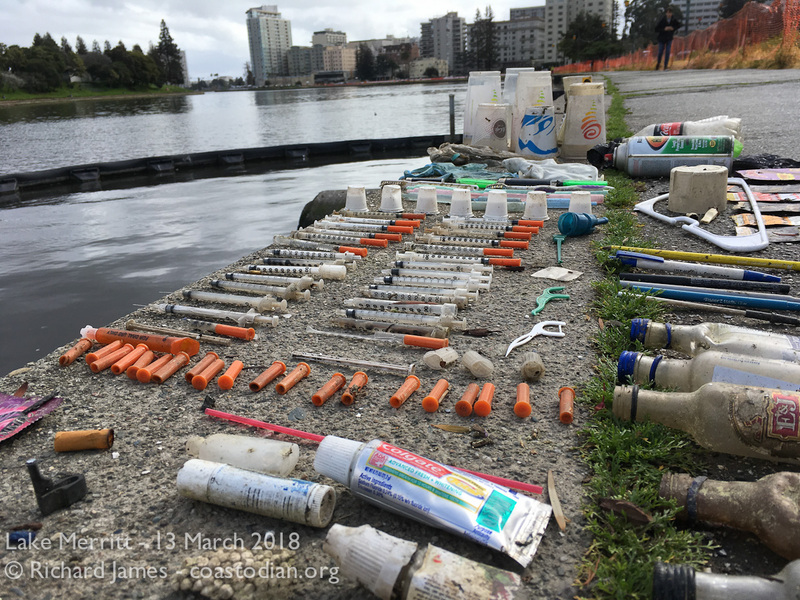 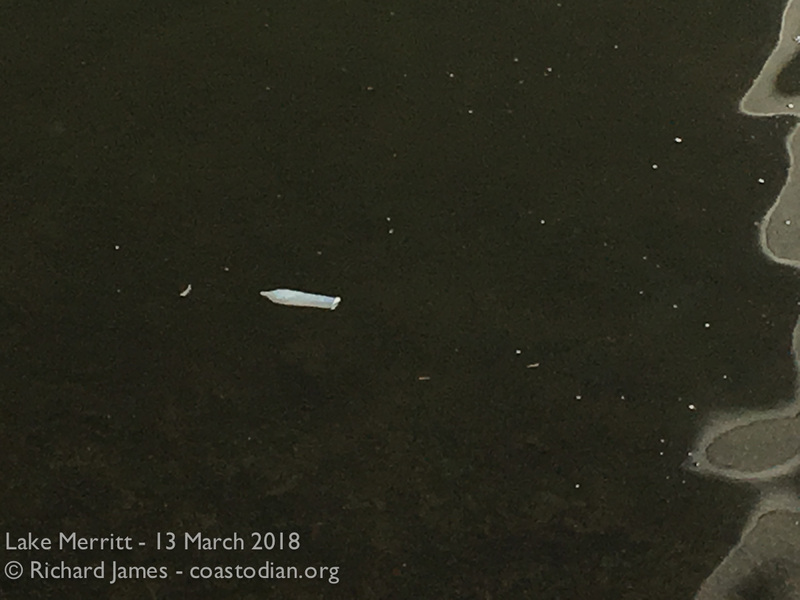 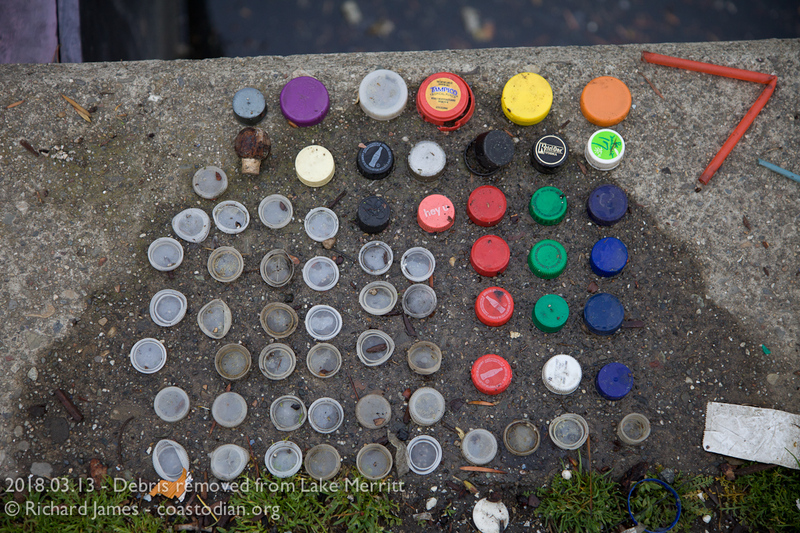 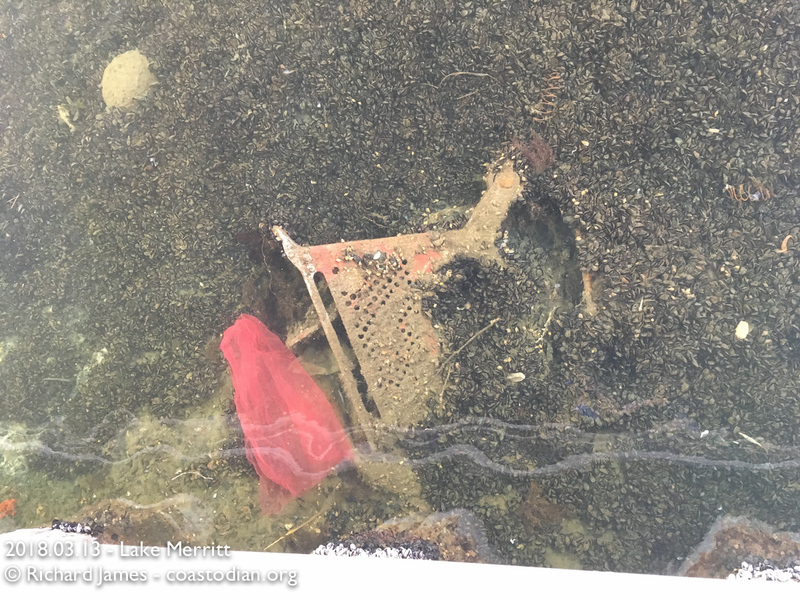 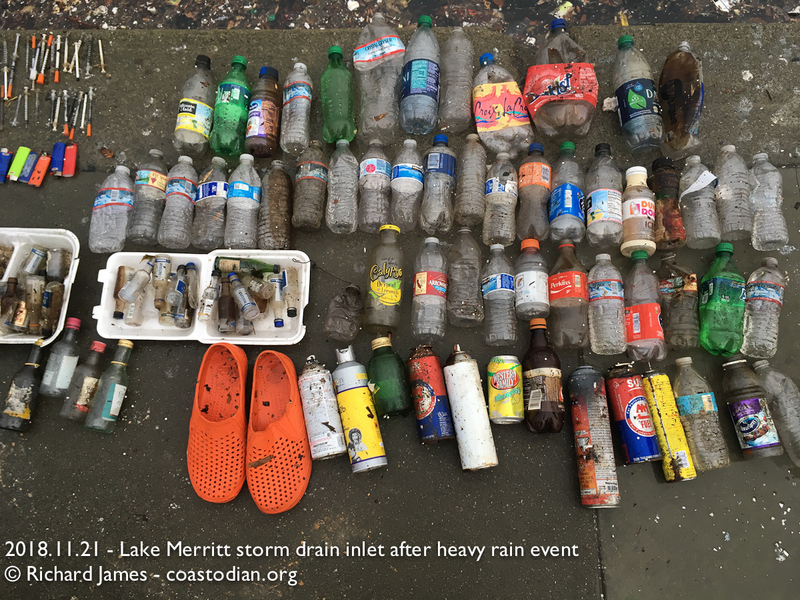 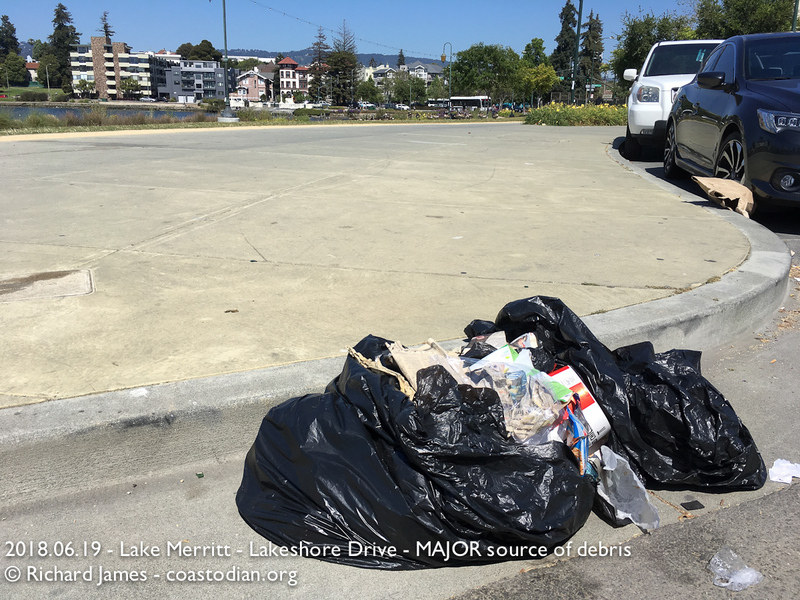 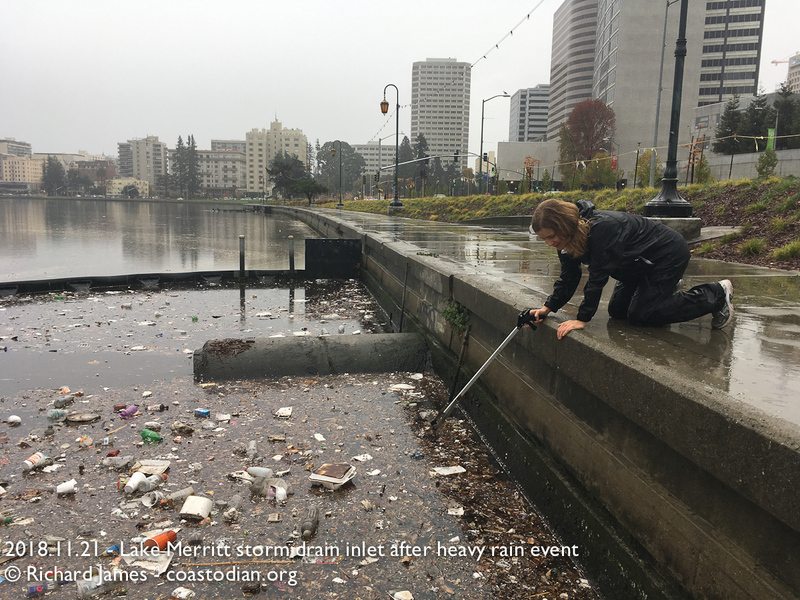 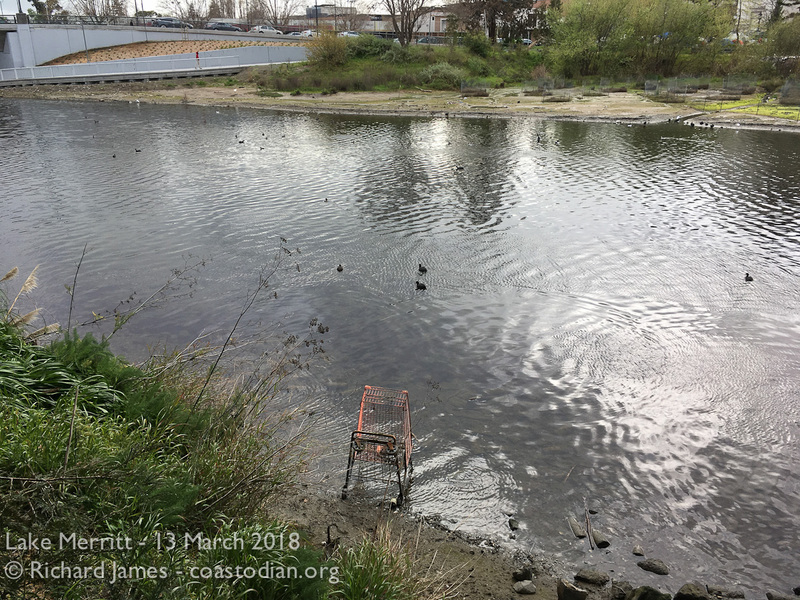 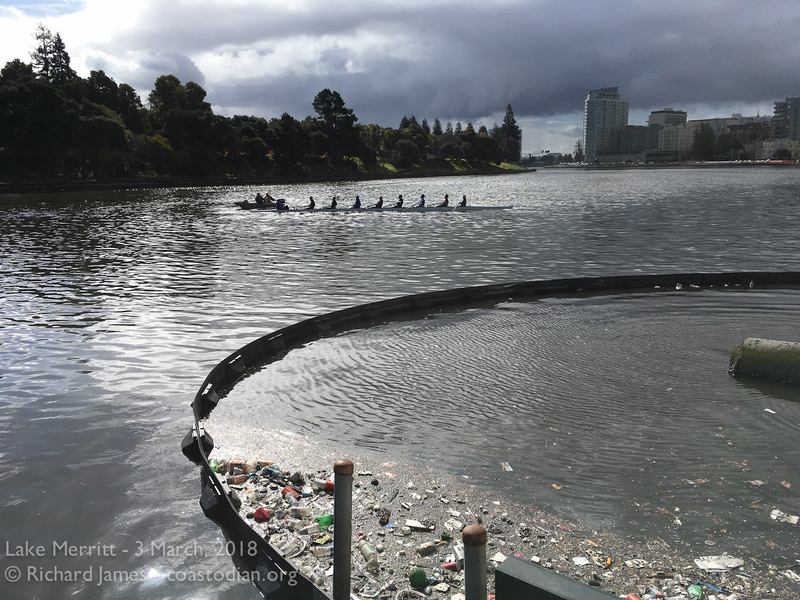 Having learned that it is much more useful to stop the flow of trash into the ocean than it is to walk the shore picking up after everyone else, I’ve been visiting Lake Merritt in Oakland the past few years to try to turn off that trash tap. 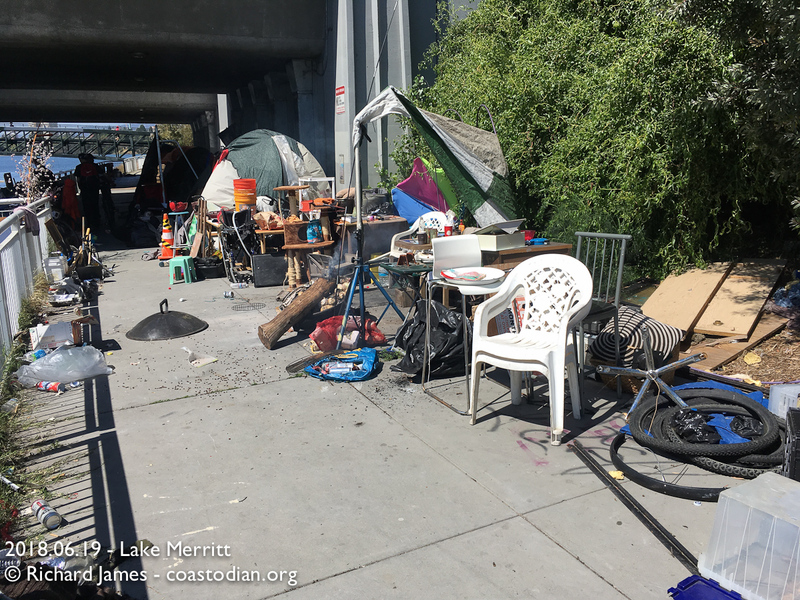 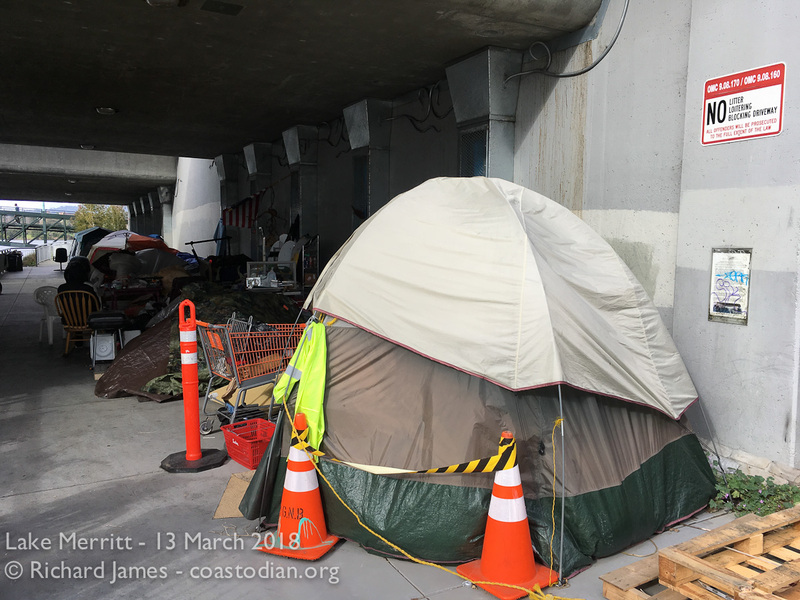 If you’ve ever visited Oakland, you’ve seen, among other things, people living everywhere – on sidewalks, under bridges, in bushes along the roads, all around Lake Merritt. 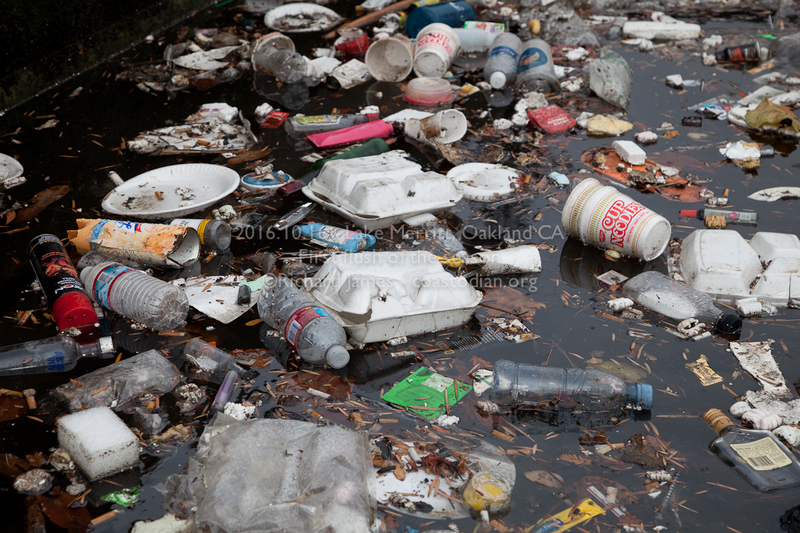 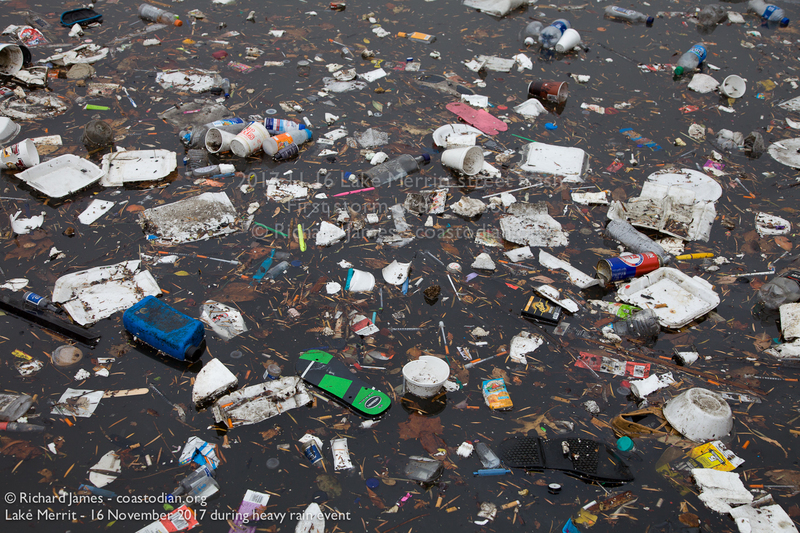 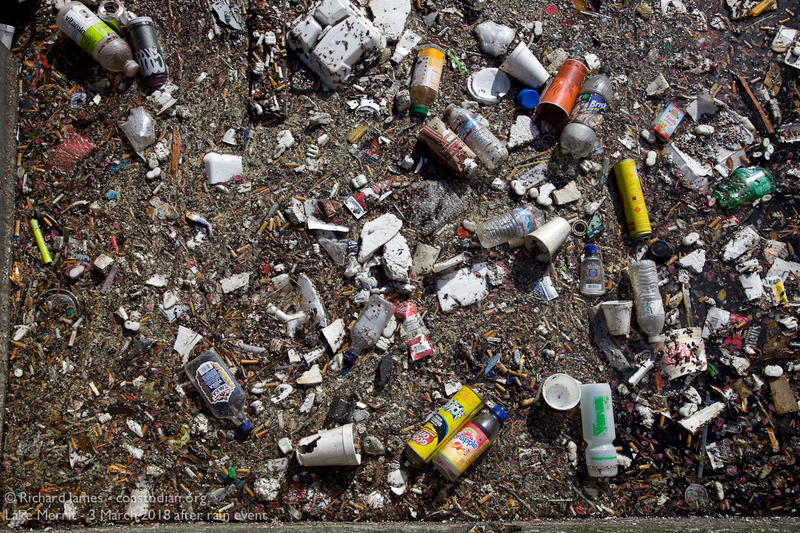 You’ve also seen streets and waterways filled with trash – EVERYWHERE. 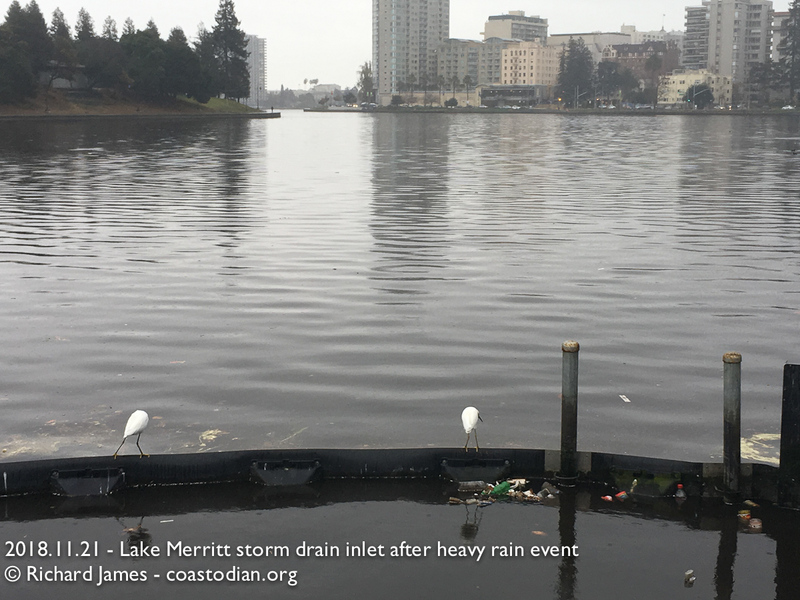 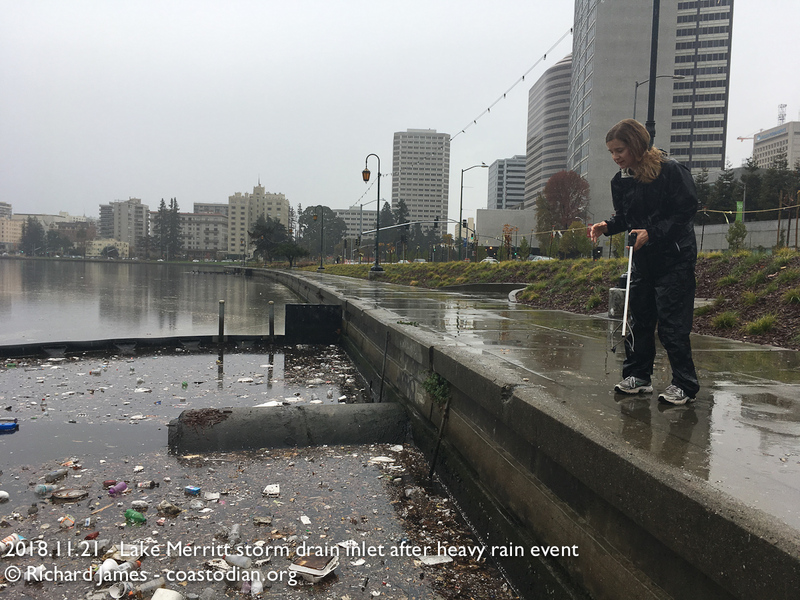 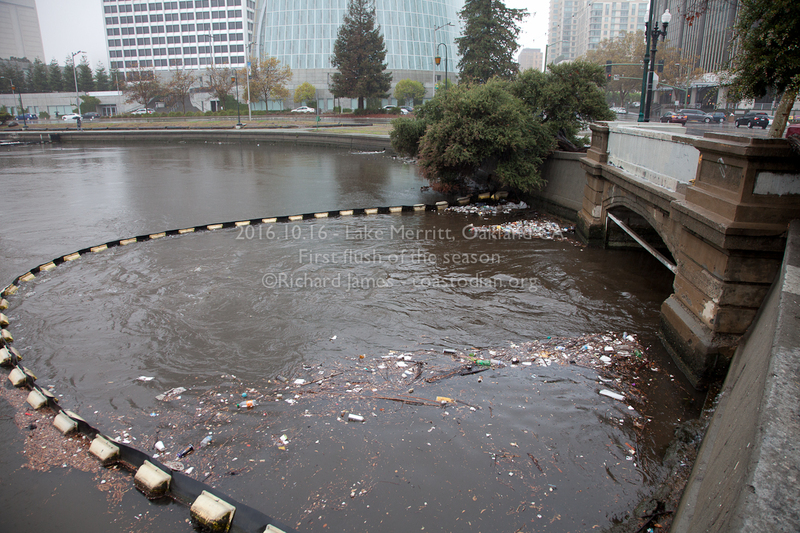 I learned what happens during the first big rain event of each season, as well as that there are 62 storm drains carrying water (and everything else) from the streets of downtown Oakland into Lake Merritt (actually an estuary, connected to SF Bay). 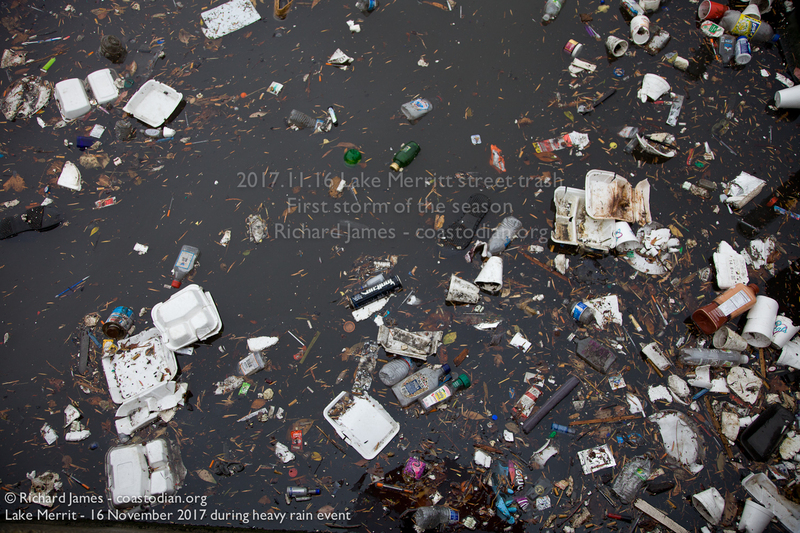 See what I saw on my first visit in October of 2016 here. 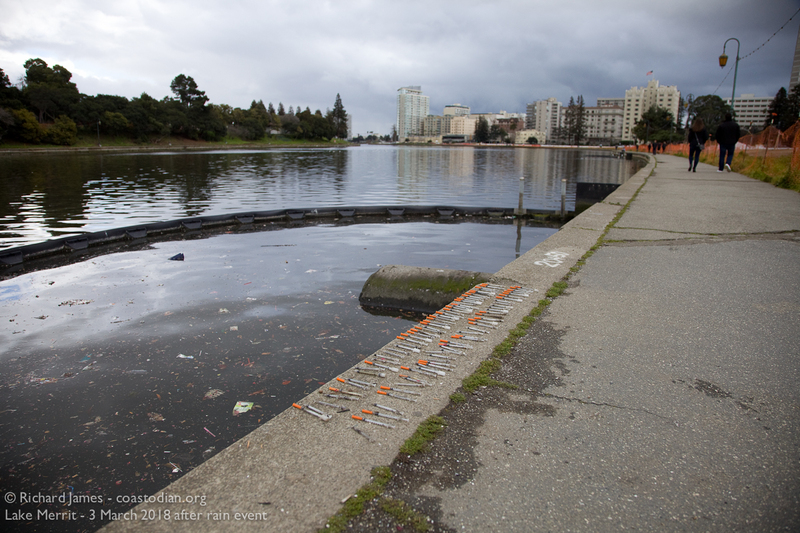 People play, boat, swim, defecate, urinate, bath, shave in Lake Merritt. 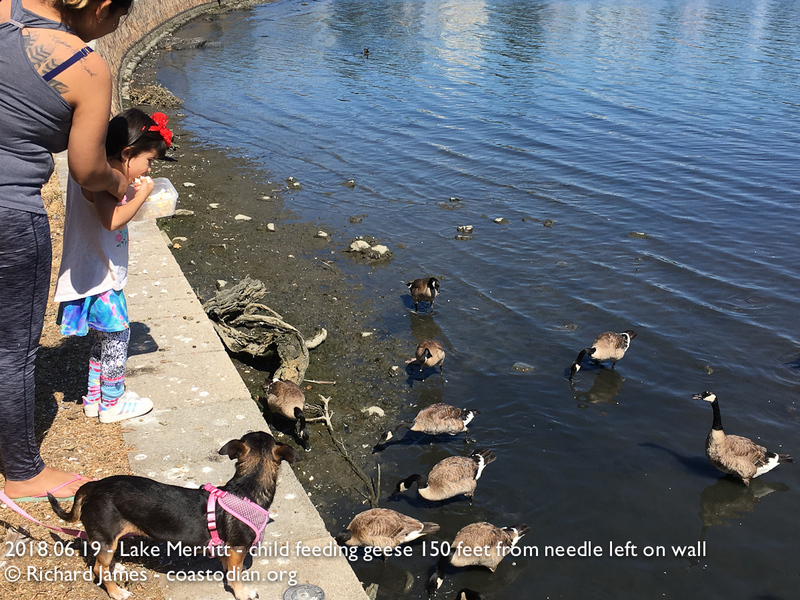 Birds and fish live and feed in Lake Merritt. 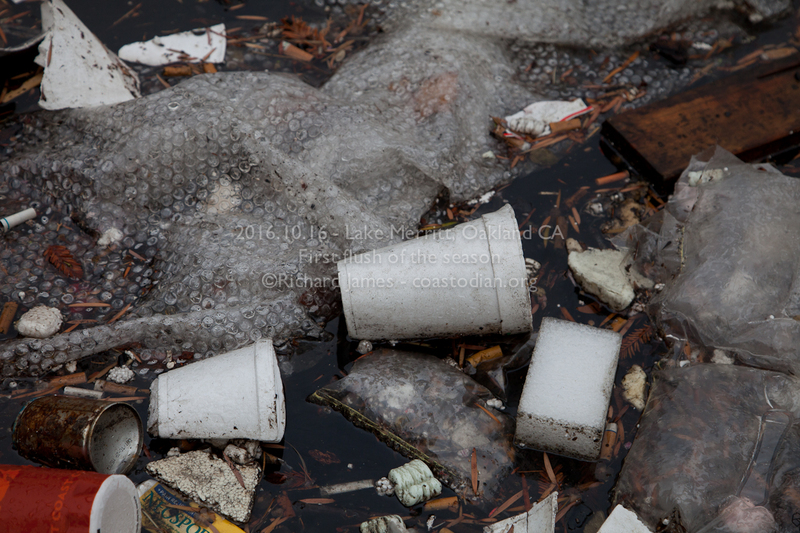 A very sad situation. 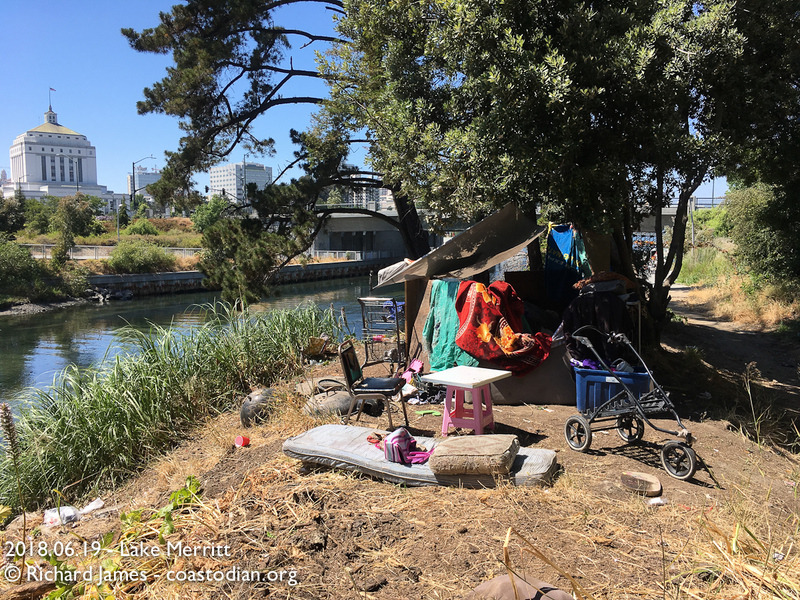 Today I read in a local paper of the latest effort to help these people living in horrid conditions off the street and into permanent housing. 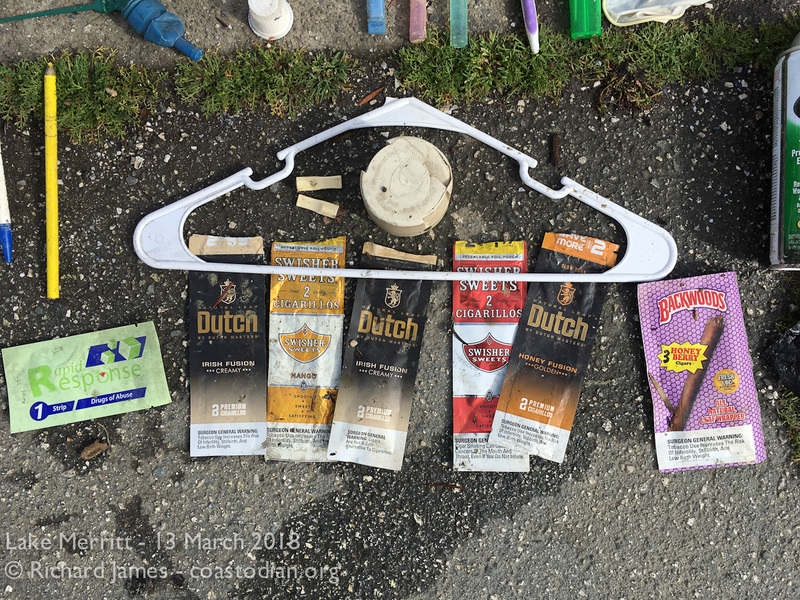 Read about that here. 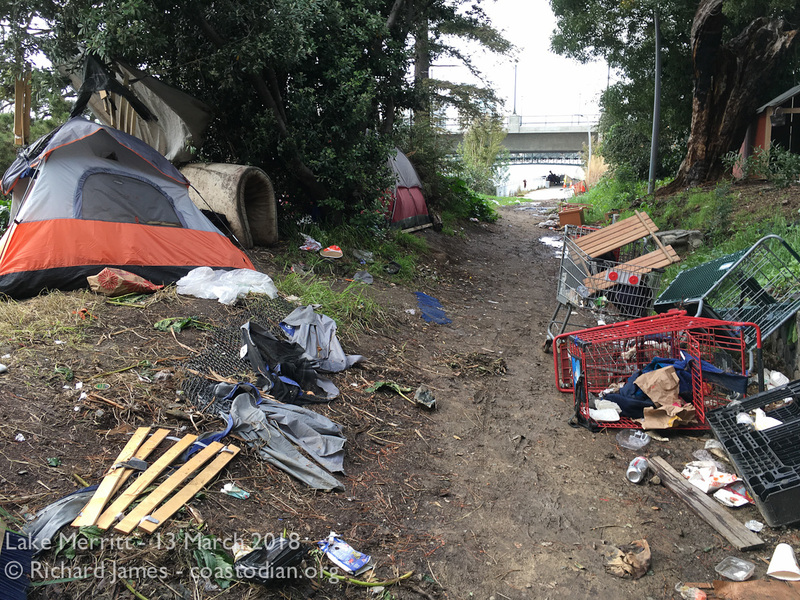 Instead of chasing homeless people from camp to camp, city to city, it seems to me to make more sense that all the different cities, Caltrans, BART, Union Pacific etc. 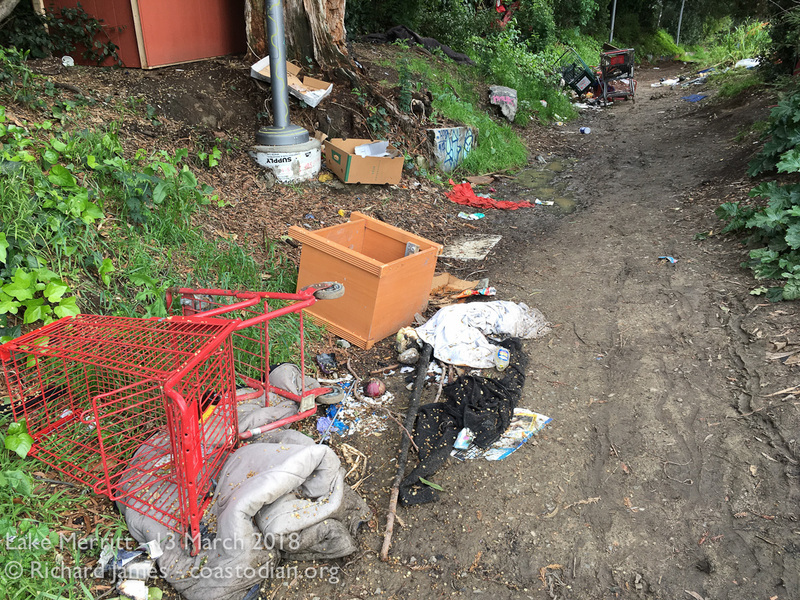 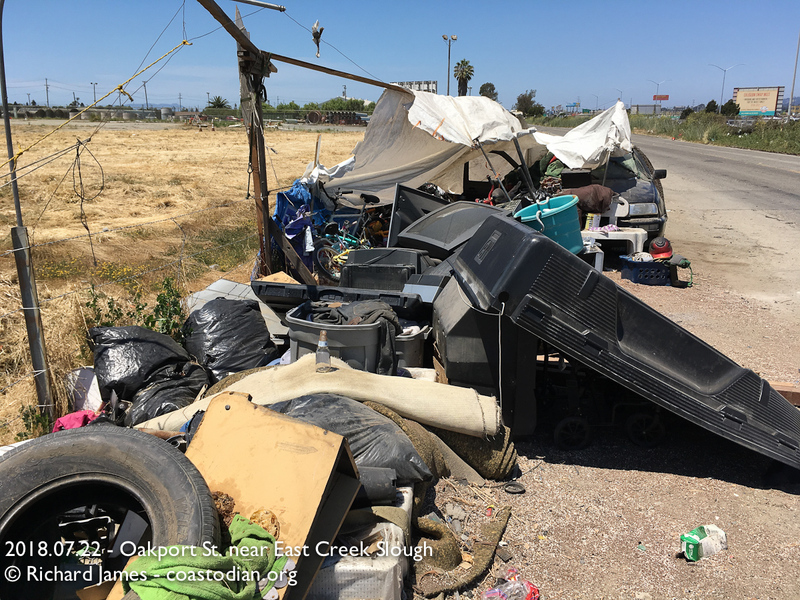 work together, share the cost and make a long term commitment to help these folks find a safer place to live that is not so damaging to the environment. 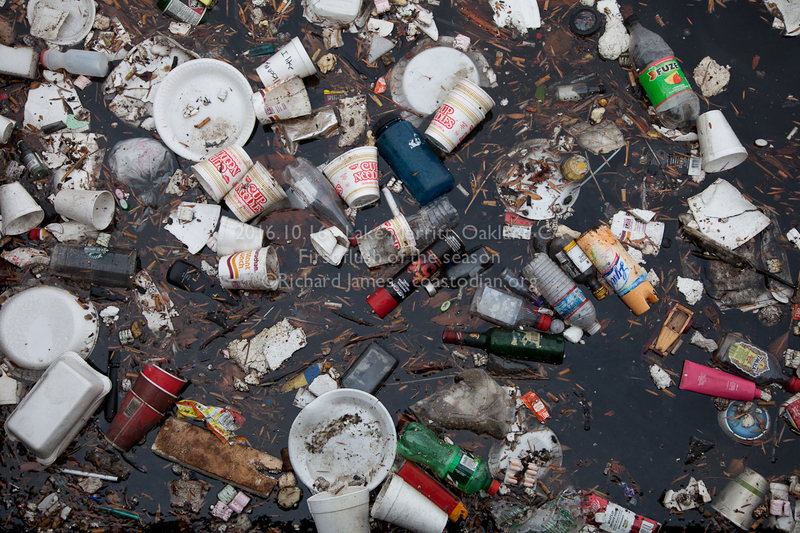 At the rate we are destroying our oceans with our plastic and other trash, WE MUST stop polluting the sea. 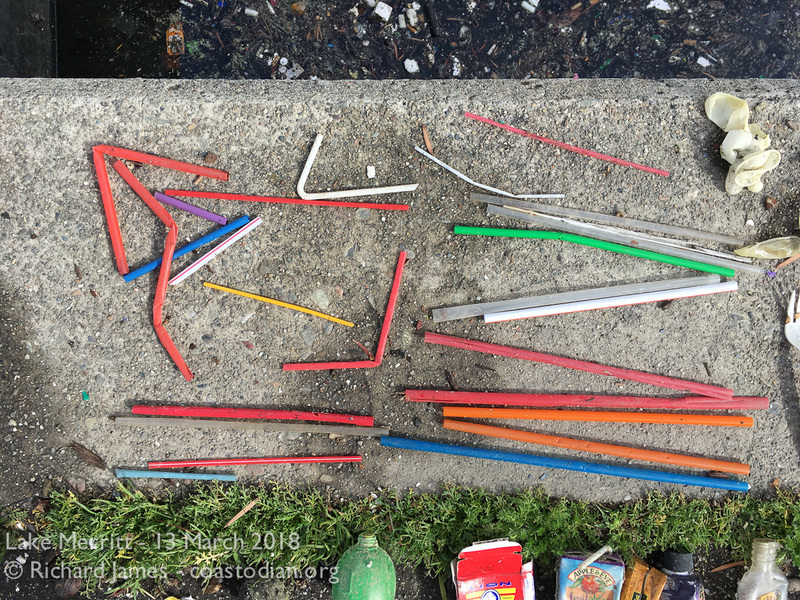 This problem will not go away simply by pushing it in to some other person’s view. 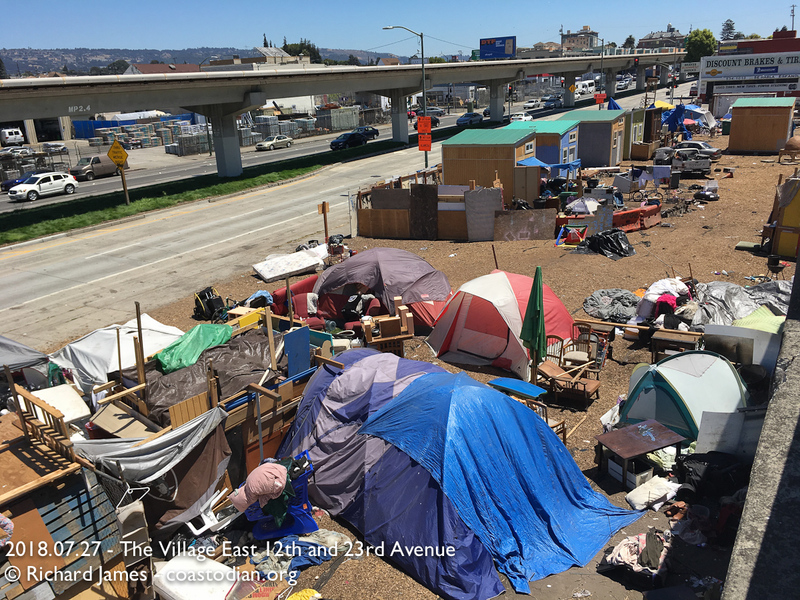 I am working to connect the above mentioned groups and encourage them to work together to develop a long-term, regional solution. 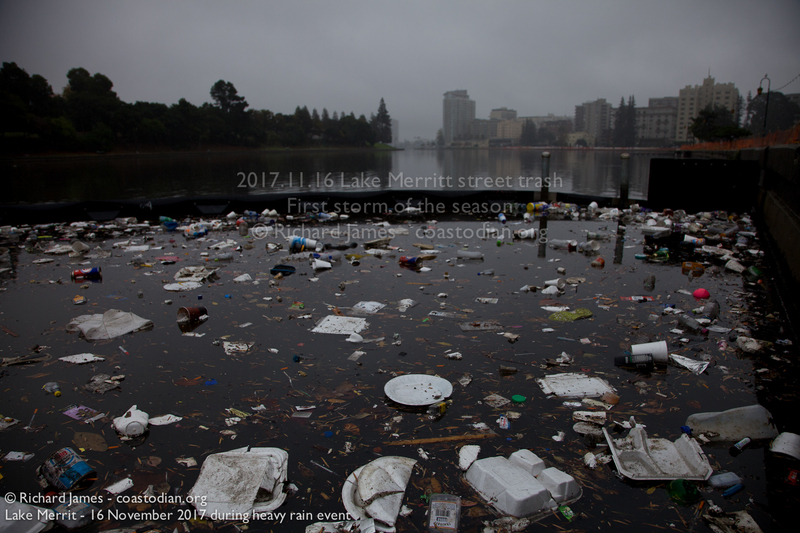 Below you can see what Lake Merritt looked like on the “first flush” of 2017. 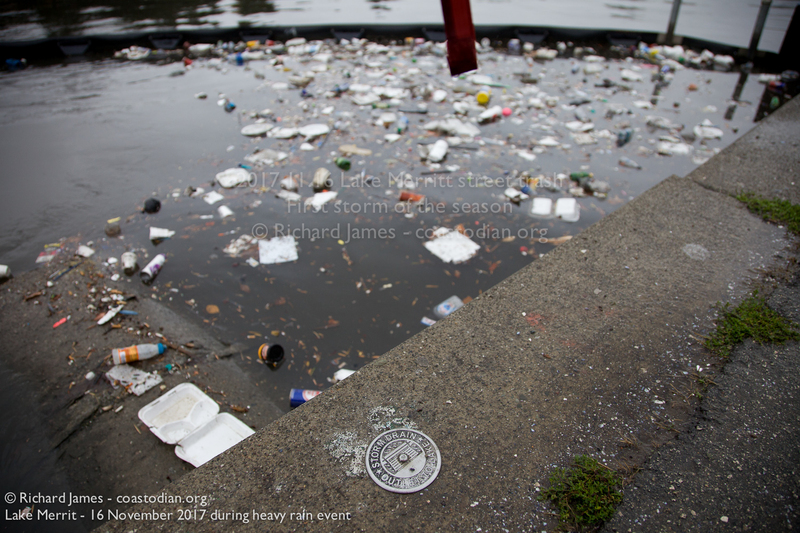 As always, click on an image to see a larger version. 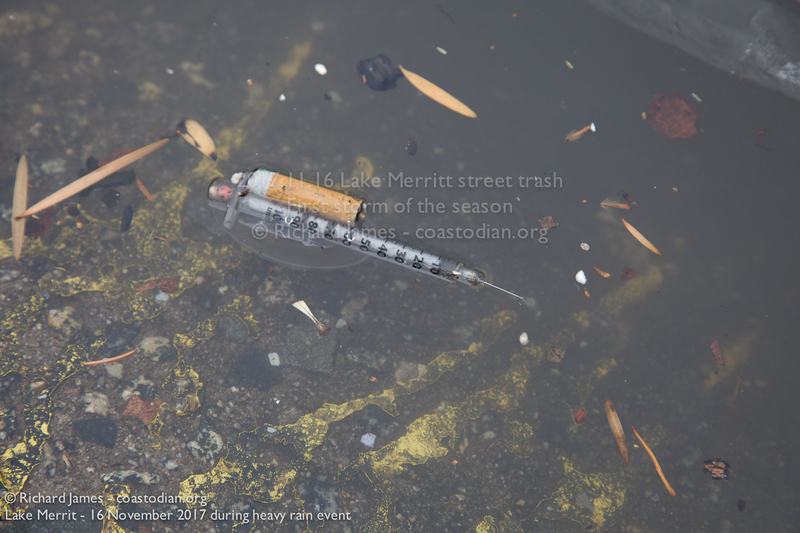 Please contact me if you wish to use any of my images in any way. 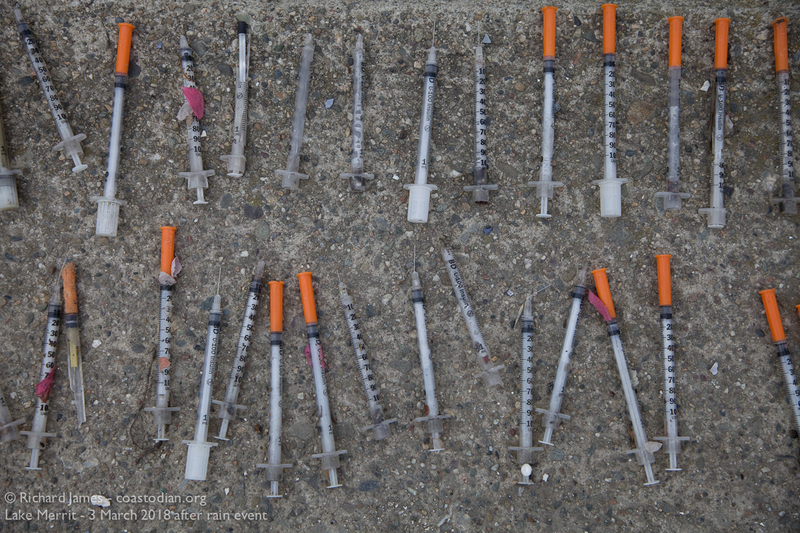 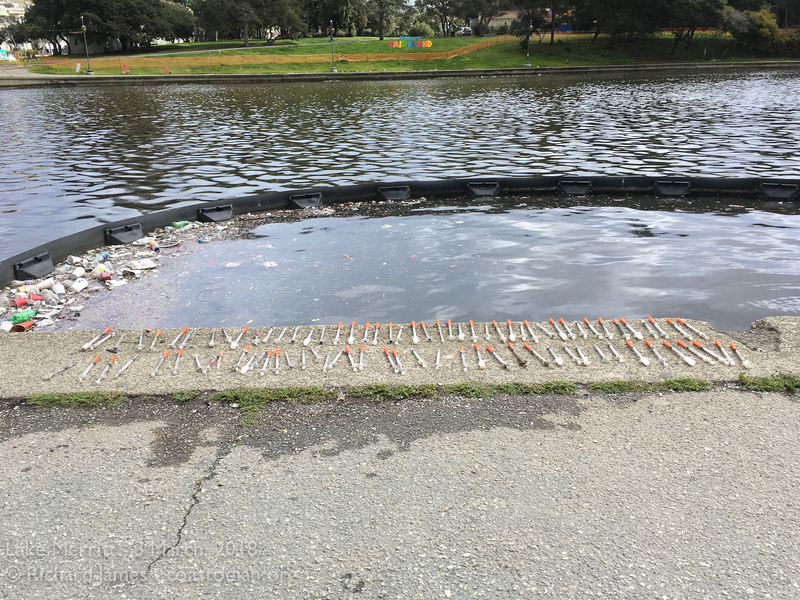 How many needles can you count? 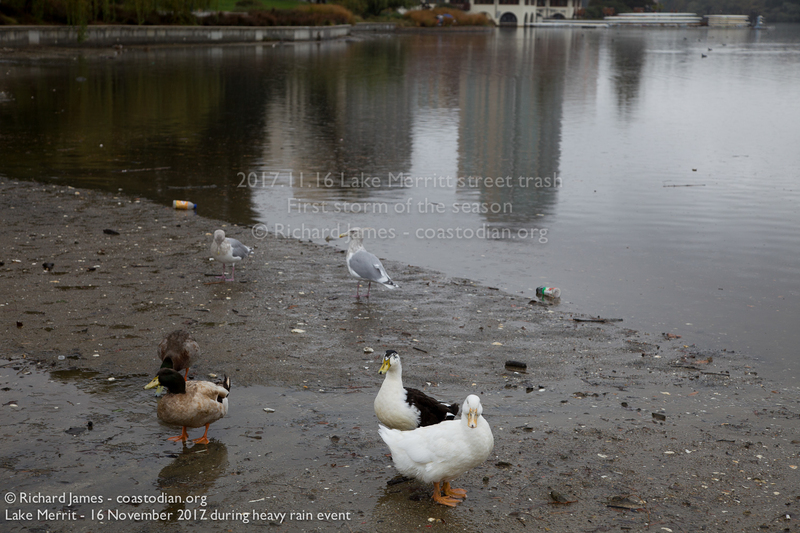 Ducks feed in Lake Merritt, amongst so much trash and human feces. 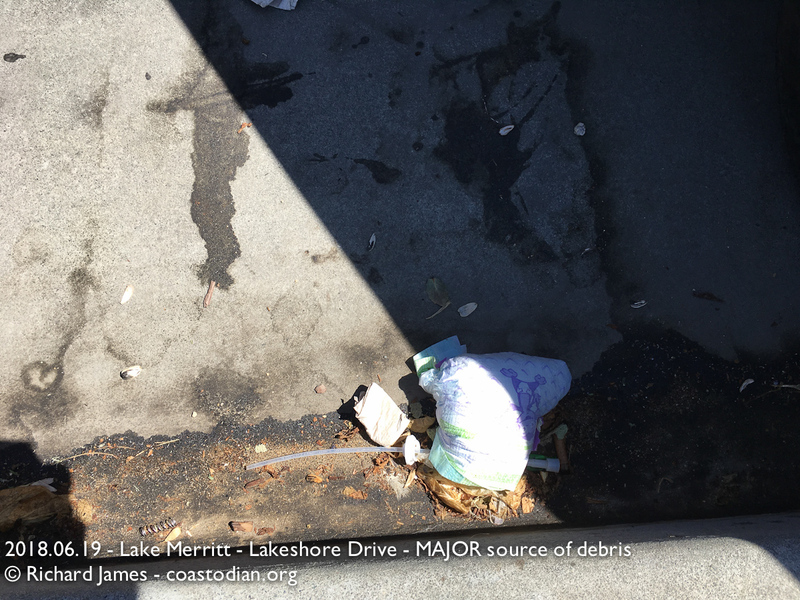 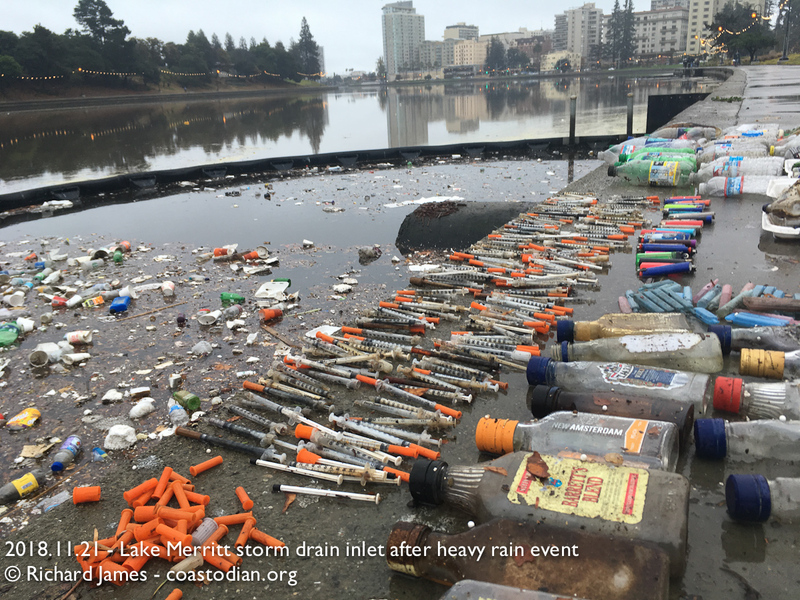 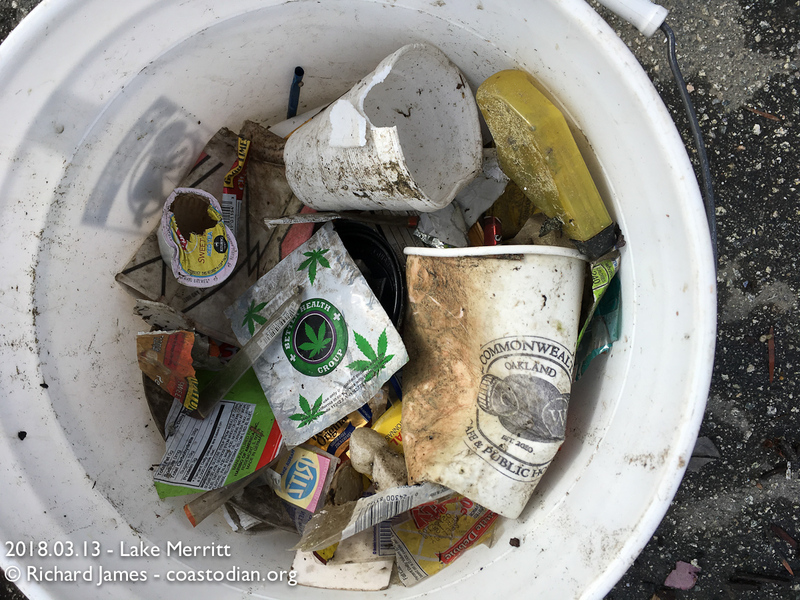 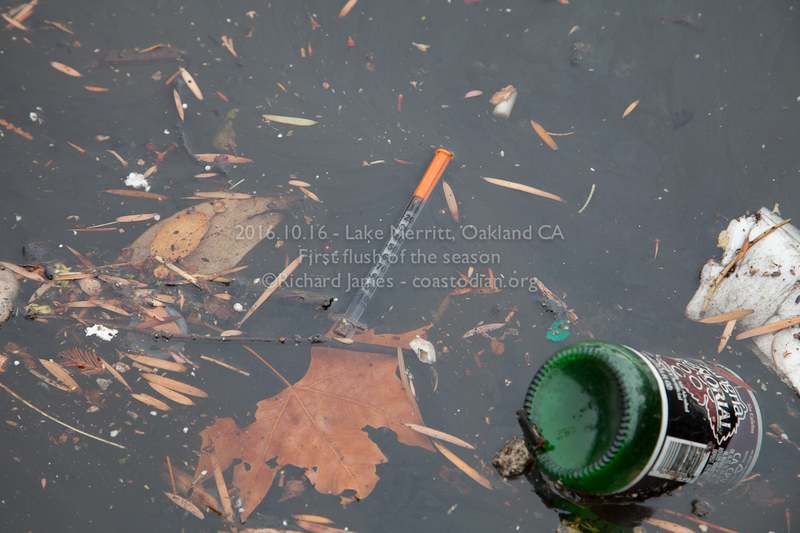 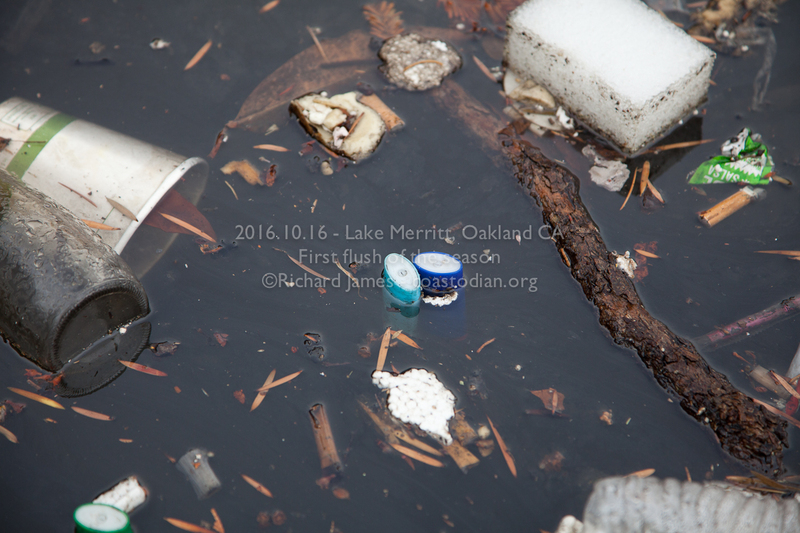 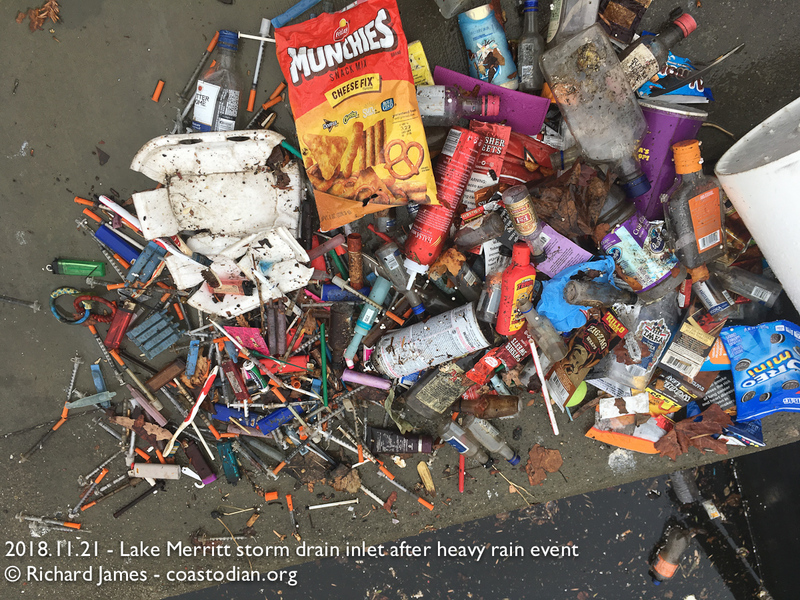 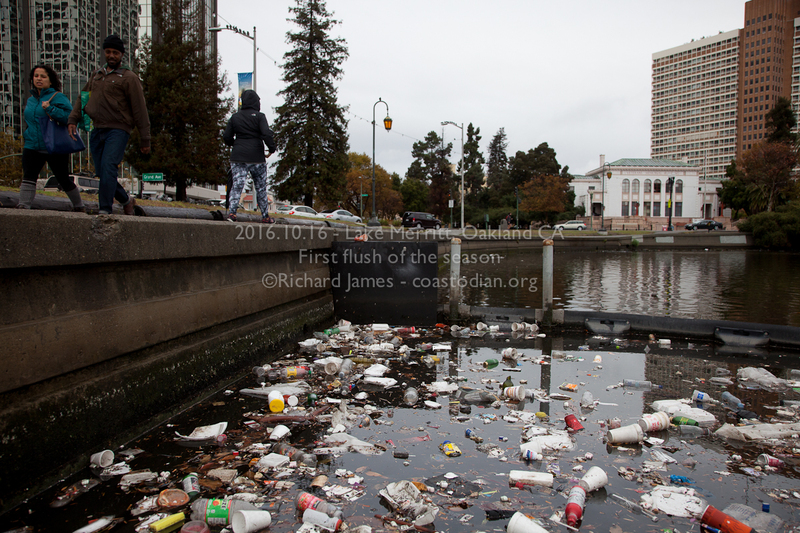 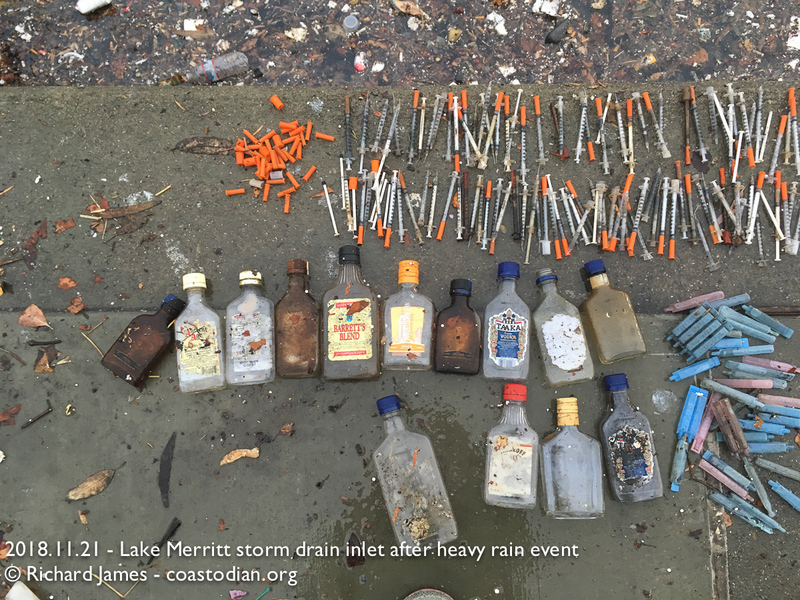 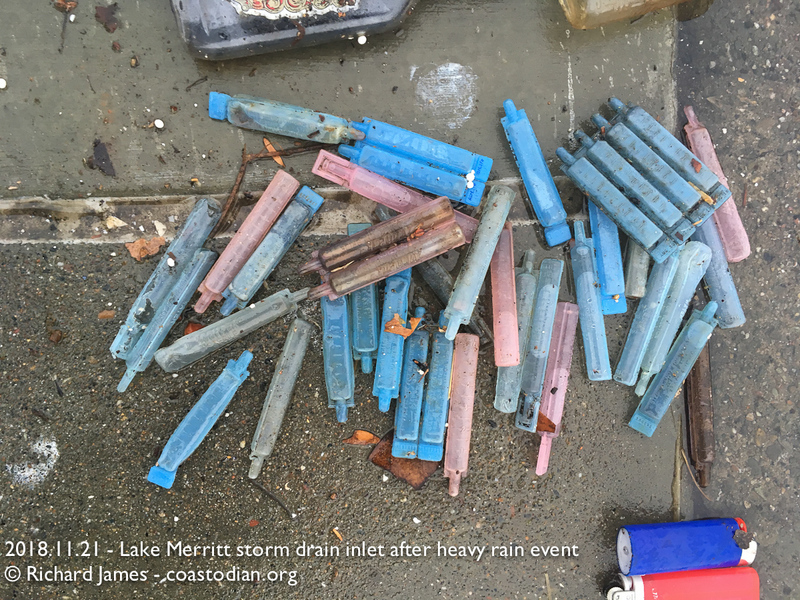 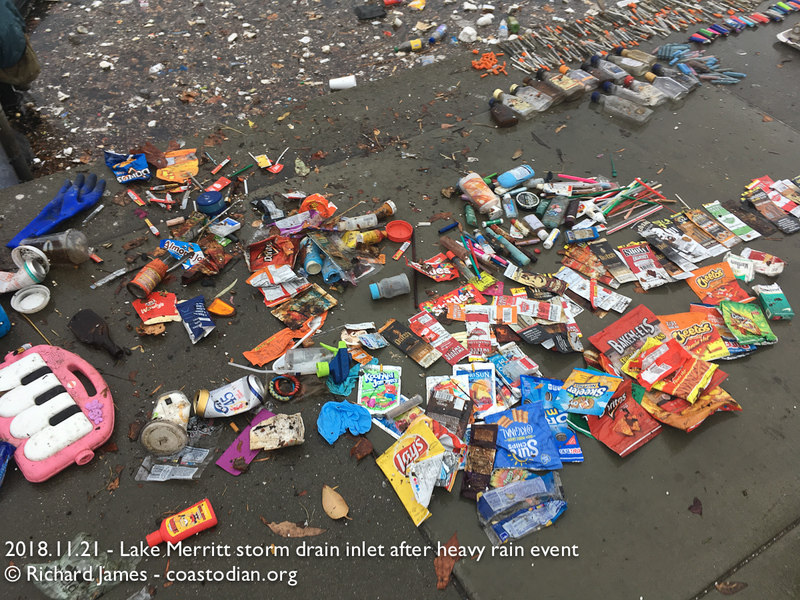 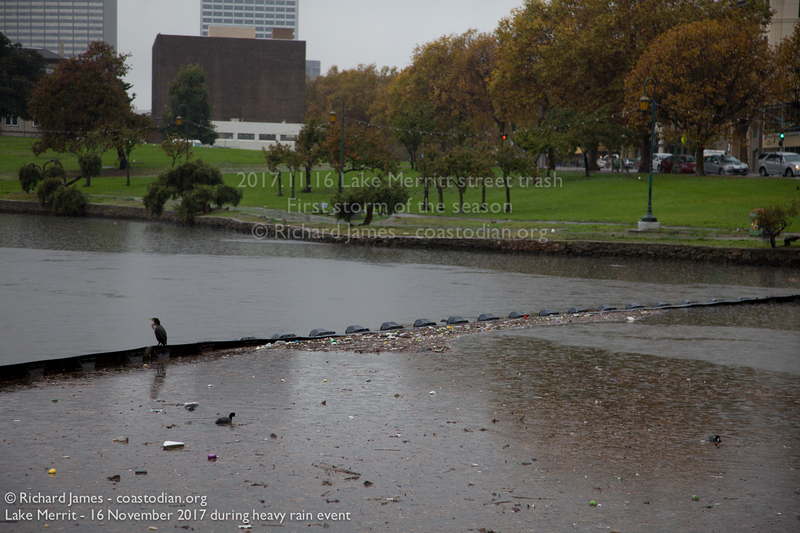 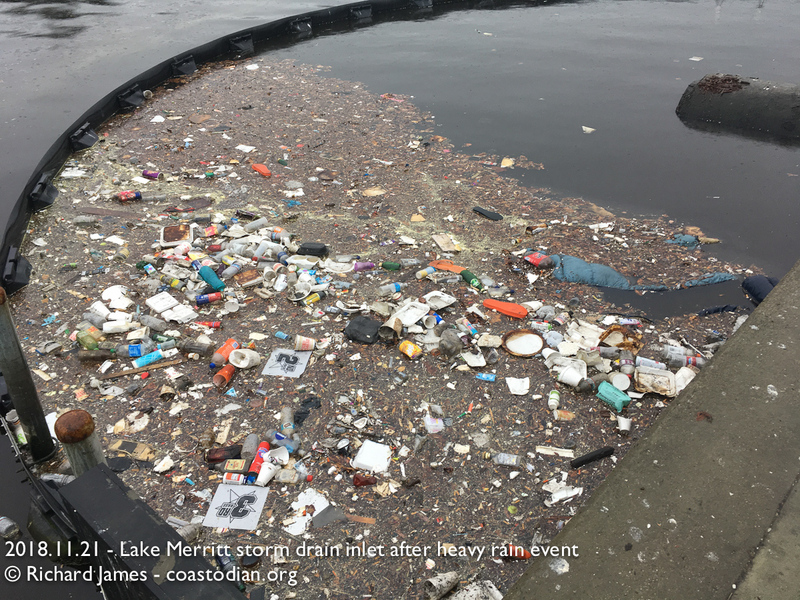 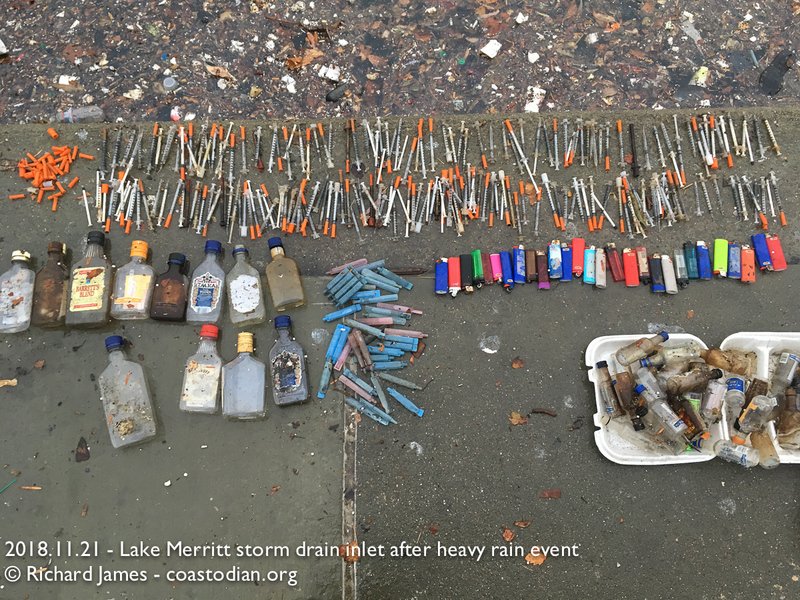 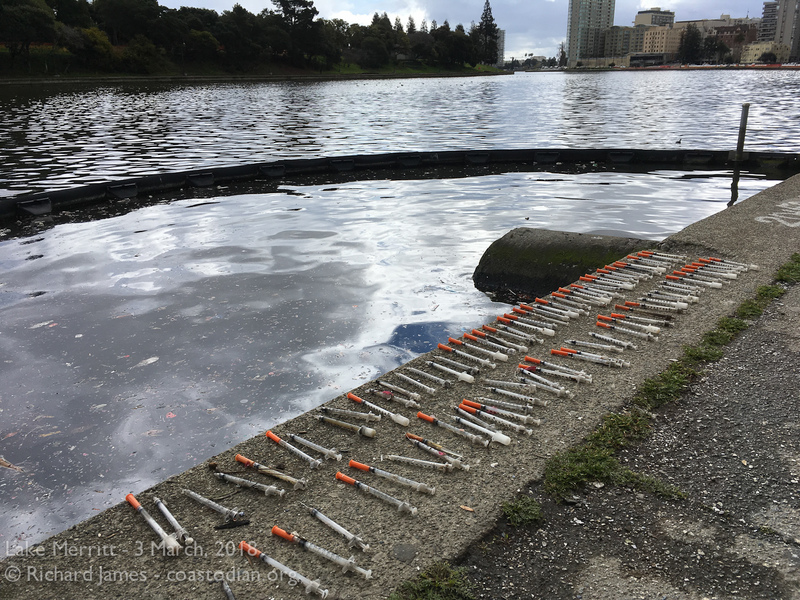 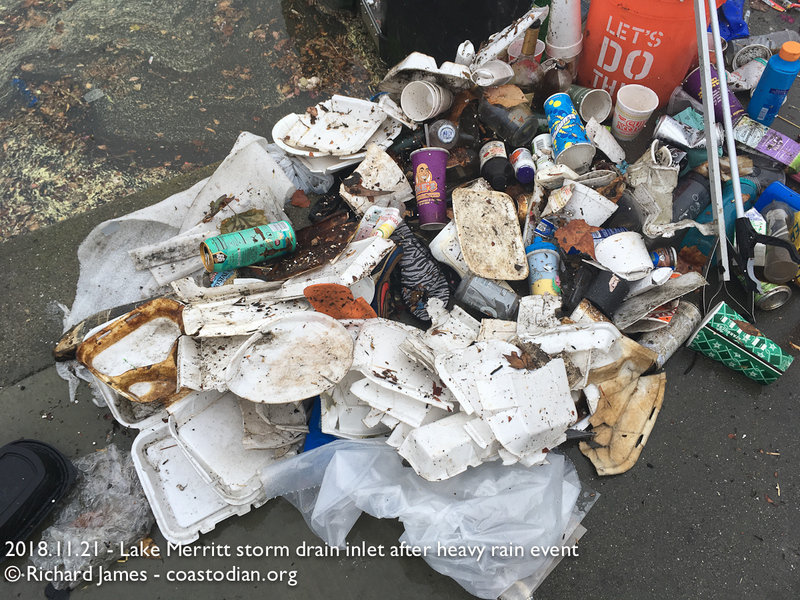 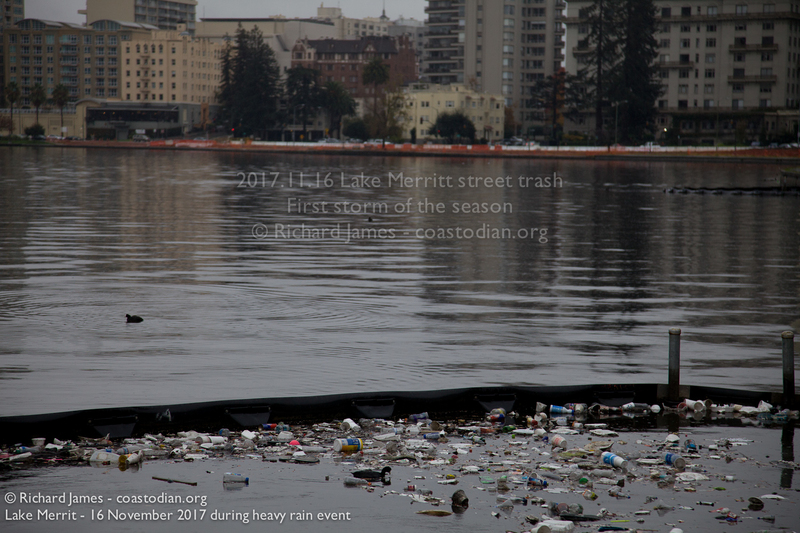 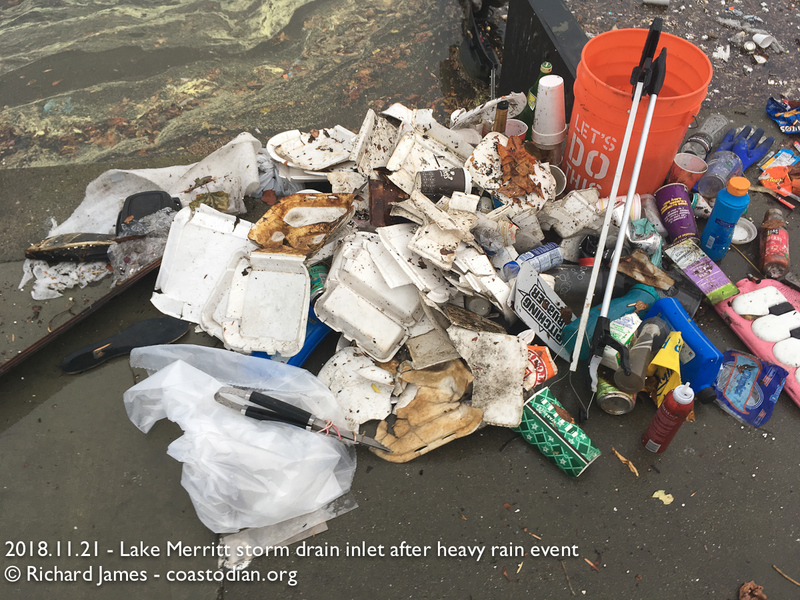 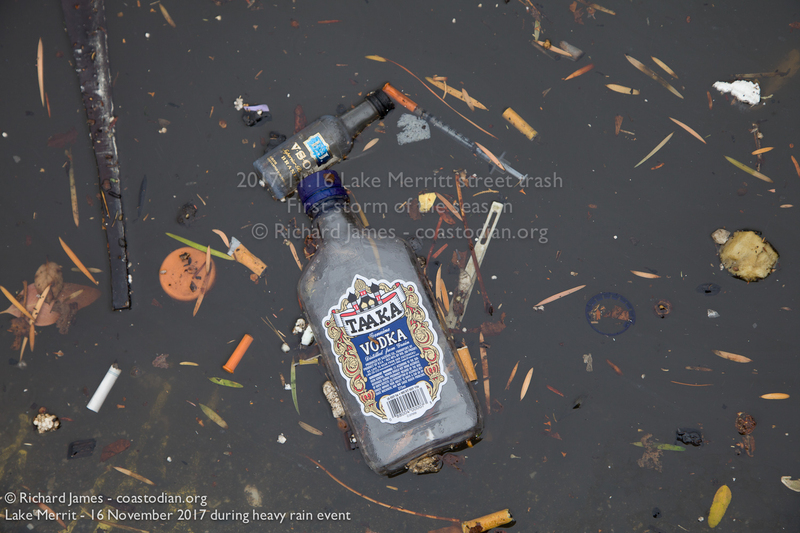 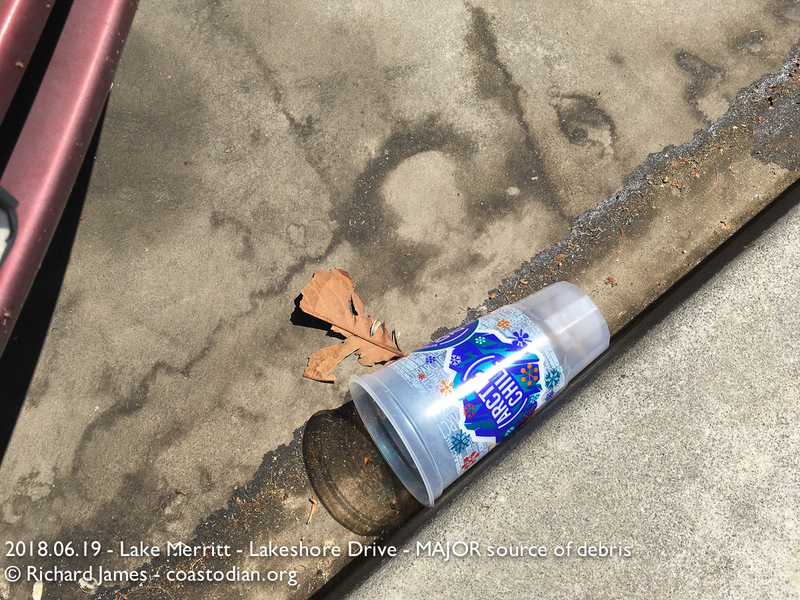 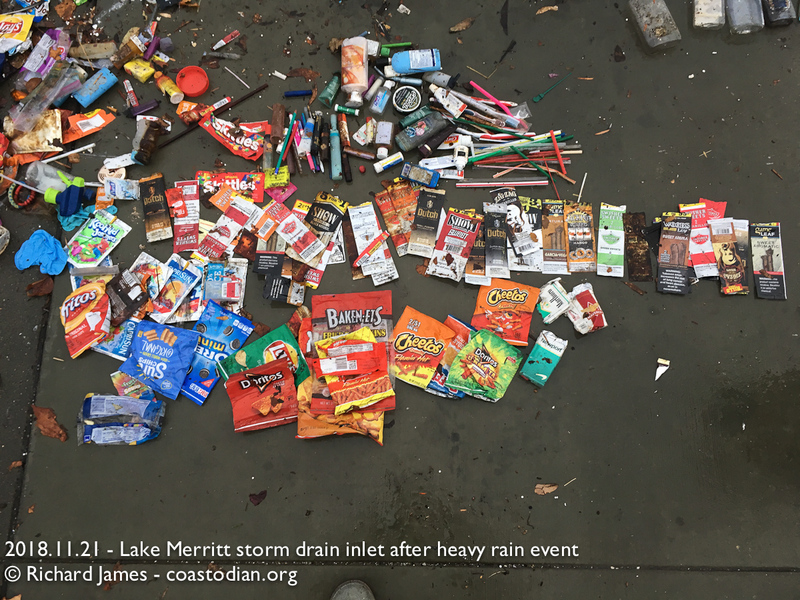 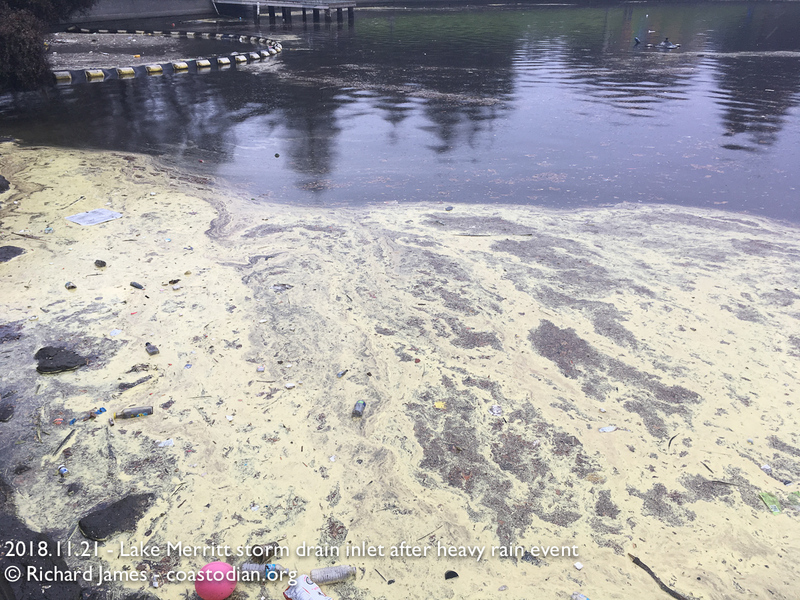 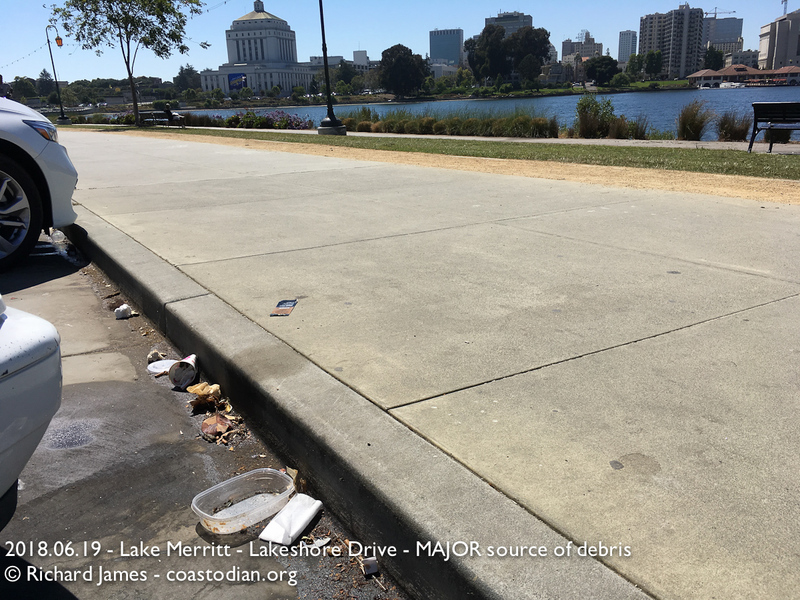 Click on the words above “Oakland’s Lake Merritt – first flush on 16 October, 2016” to see this entire post. 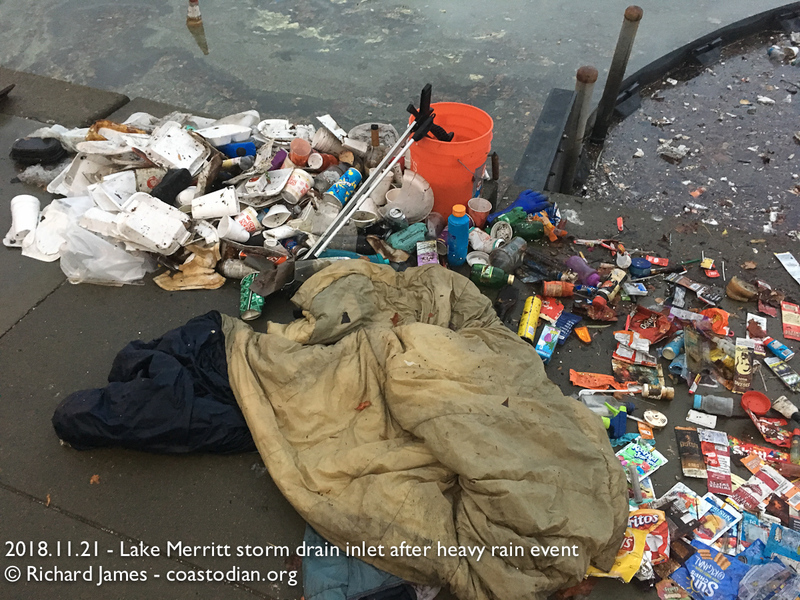 Being somewhat learned about trash, and less so about water, I called the guys at the boat store where I buy my kayaks in Oakland, California Canoe & Kayak last October just as a huge storm was bearing down on us. 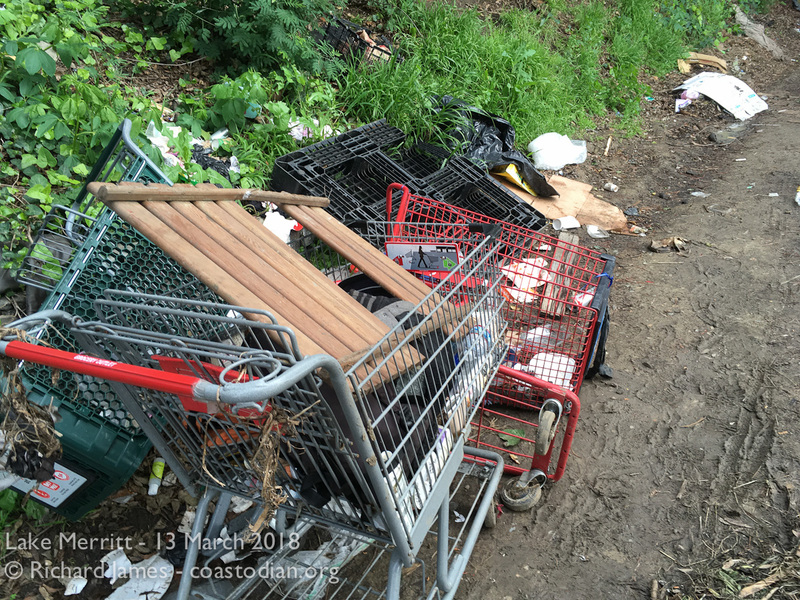 “Where will I find the trash.” I asked? 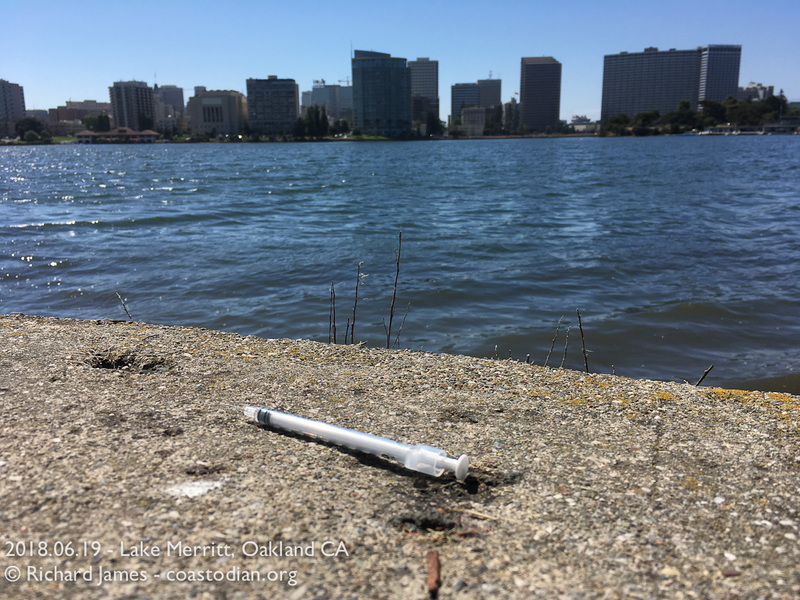 “Lake Merritt!” , was the reply, without hesitation. 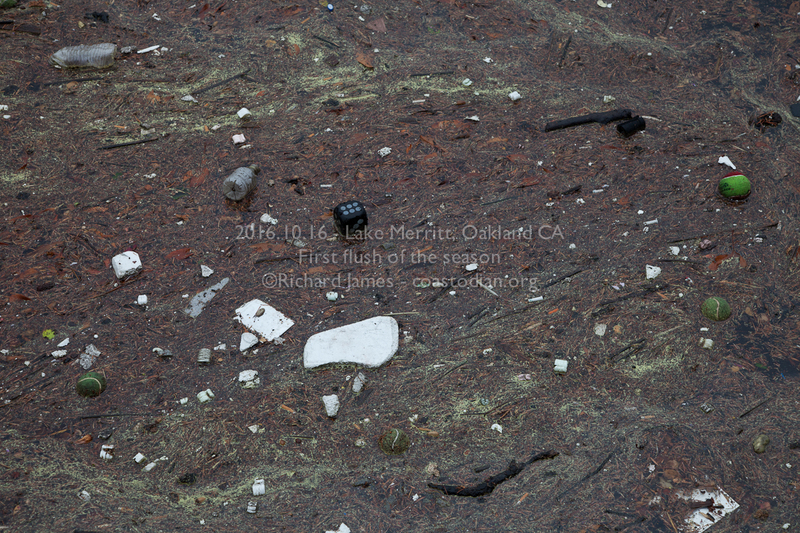 So off I went, cameras, umbrella and rain gear packed. 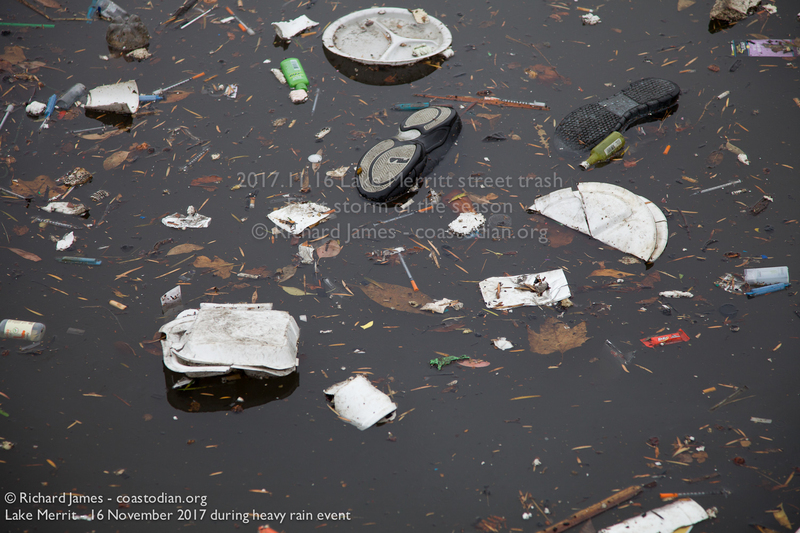 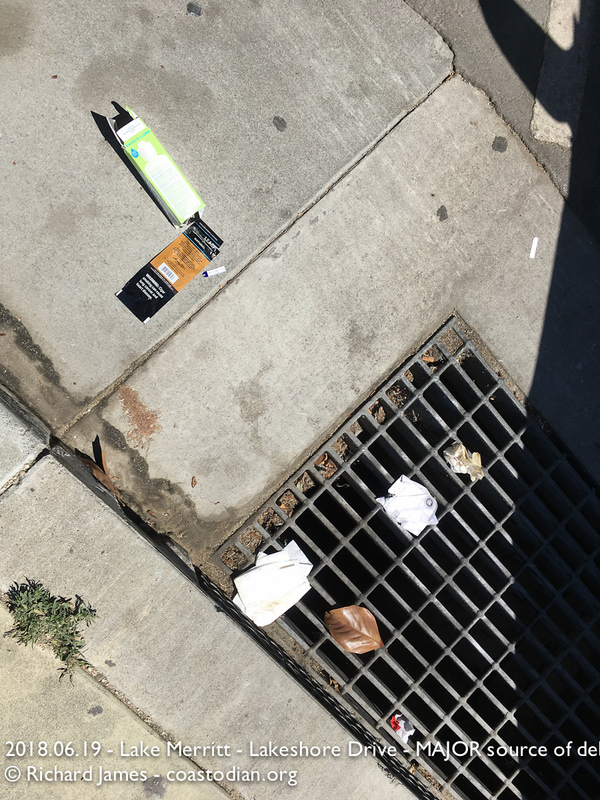 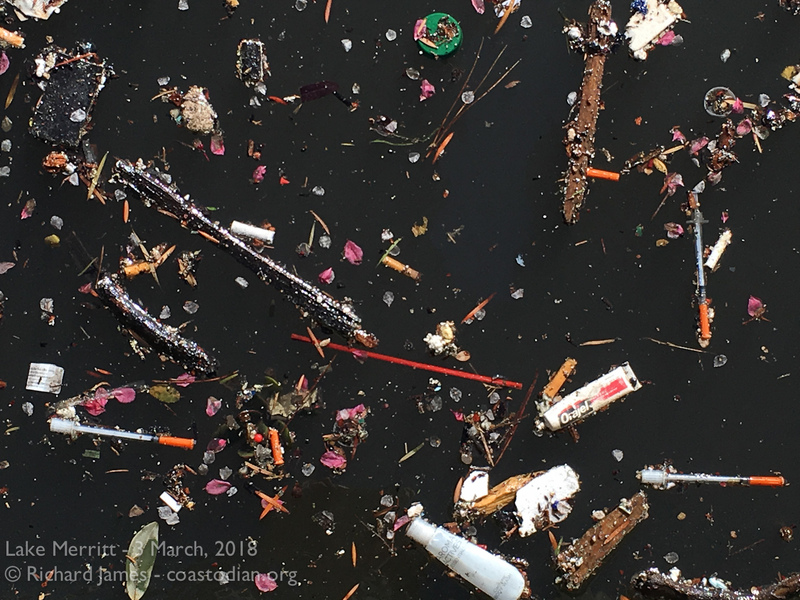 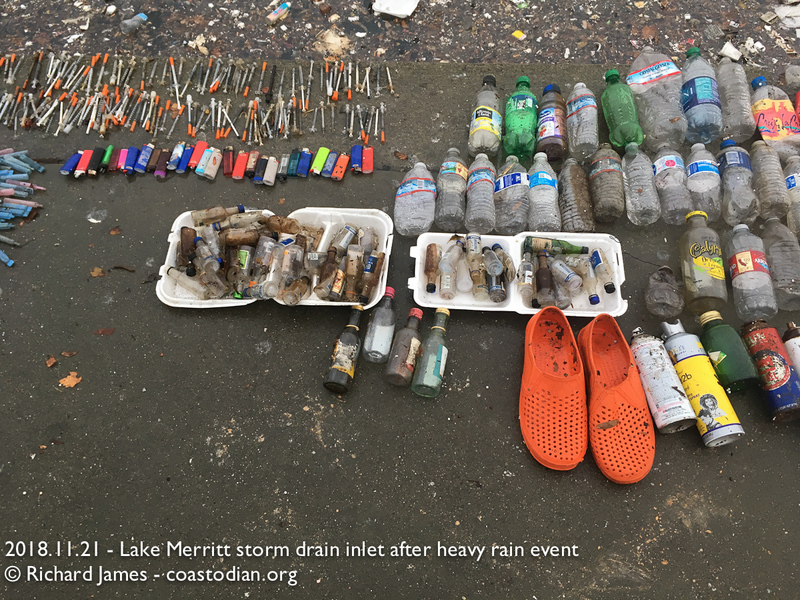 Not only does the first big rain of the year make roads slick with oil, it also scours the streets and drains of all the trash left by humans in the wrong place, carrying it towards the sea. 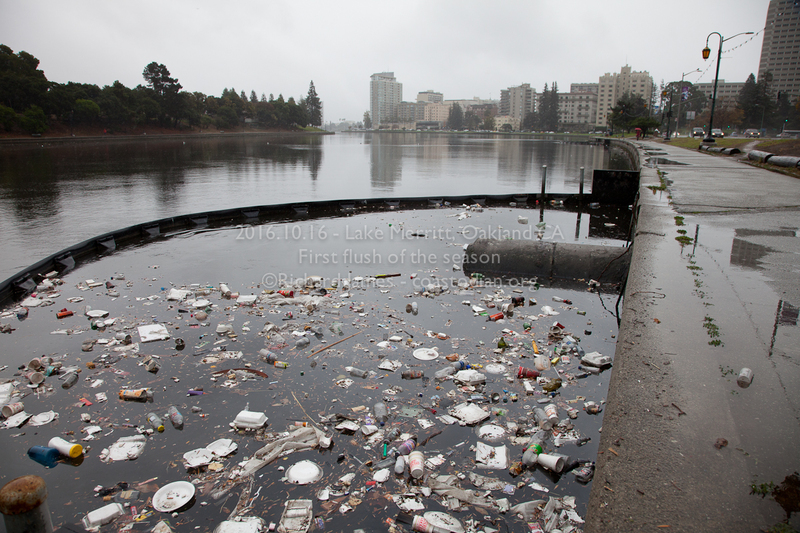 Or, in this case, Lake Merritt. 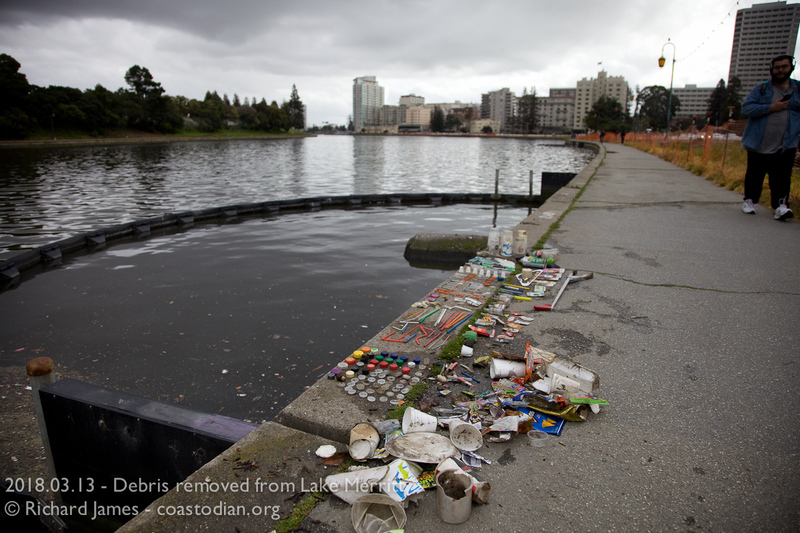 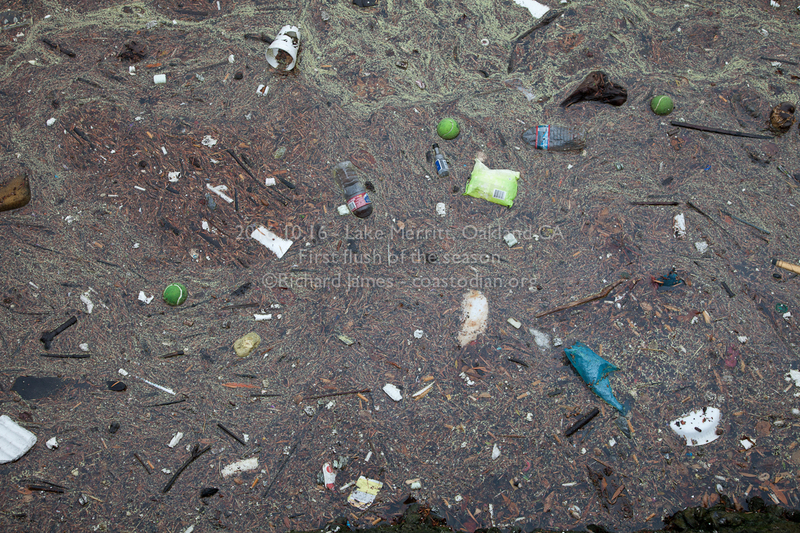 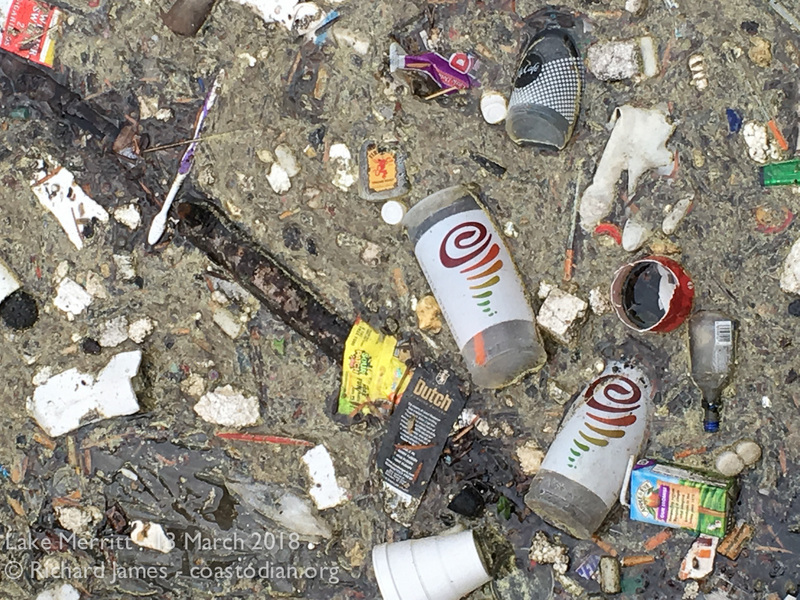 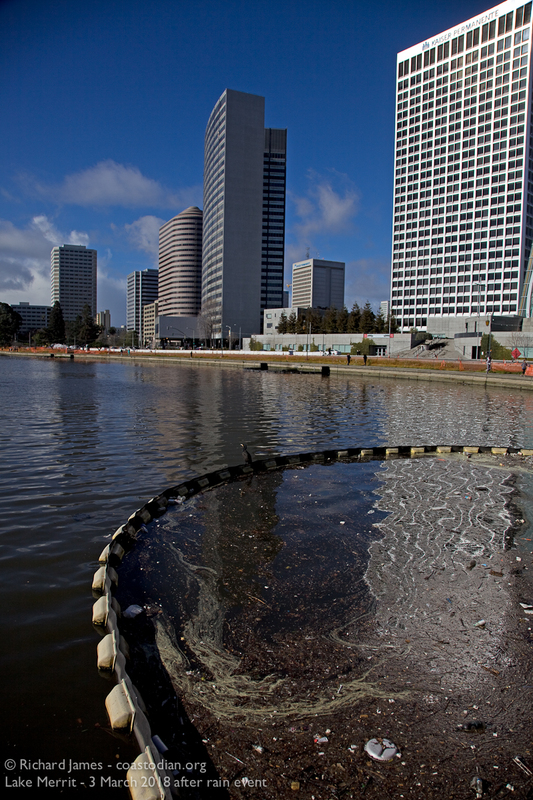 The inlets that bring storm drain run off from the streets of Oakland to Lake Merritt are swirling pools of detritus. 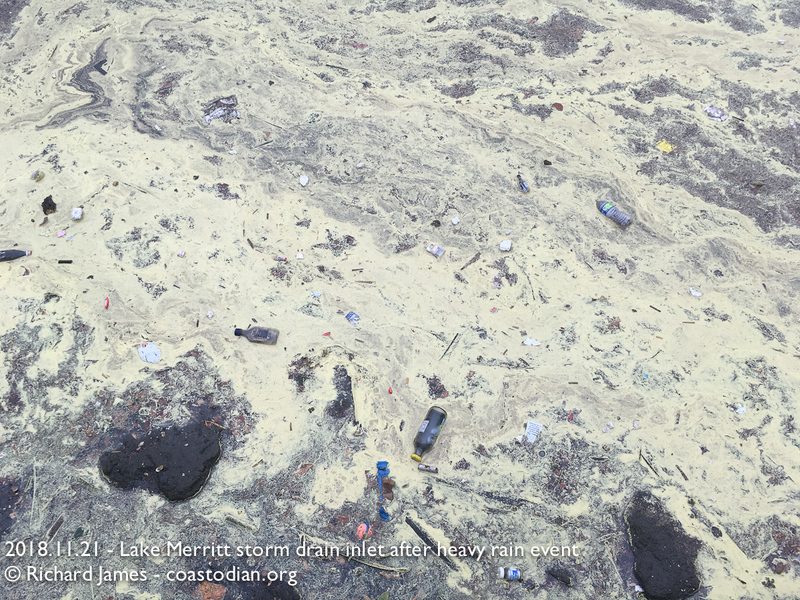 Imagine walking 4 miles down South Beach after a storm, compressed into three-hundred square feet. 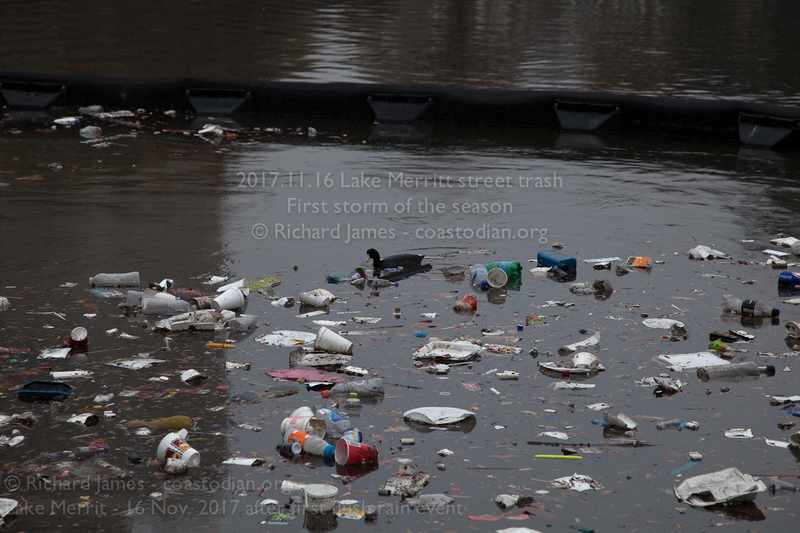 This is where much of the 8.5 million tons of plastic that we humans dump into the oceans each year (and growing) comes from. 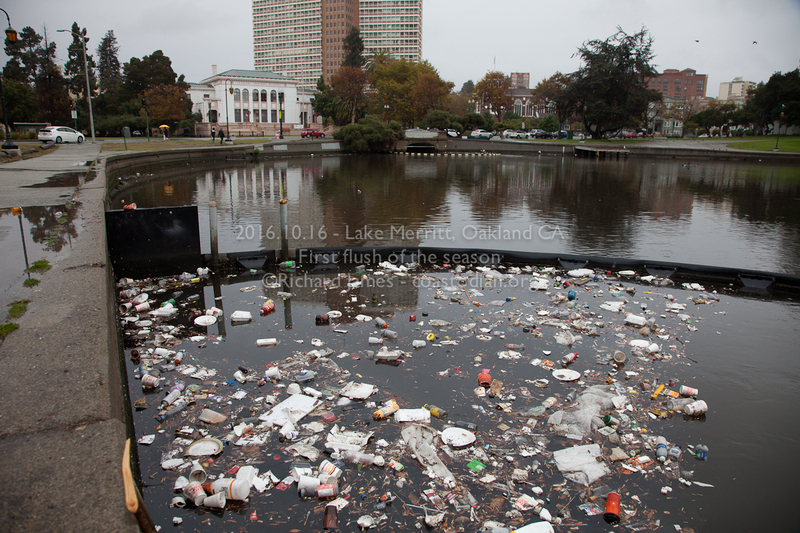 We need to fix this. 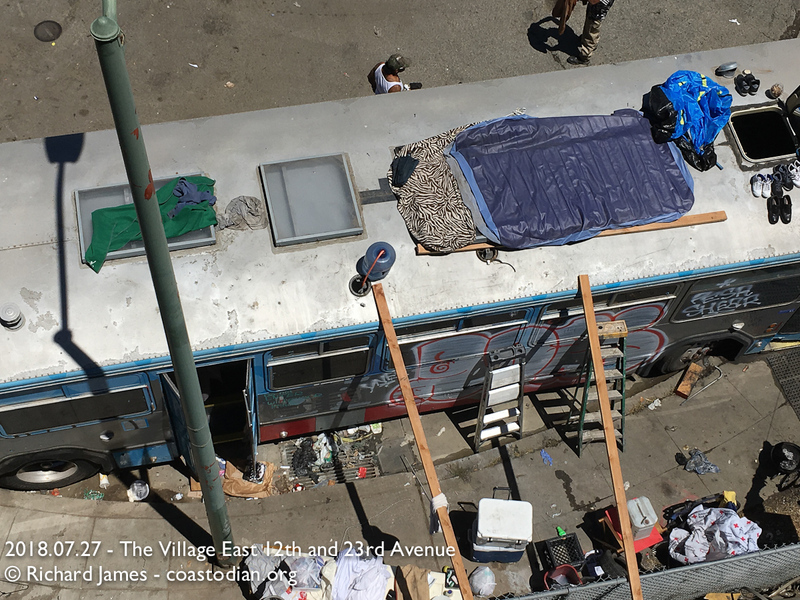 Soon. 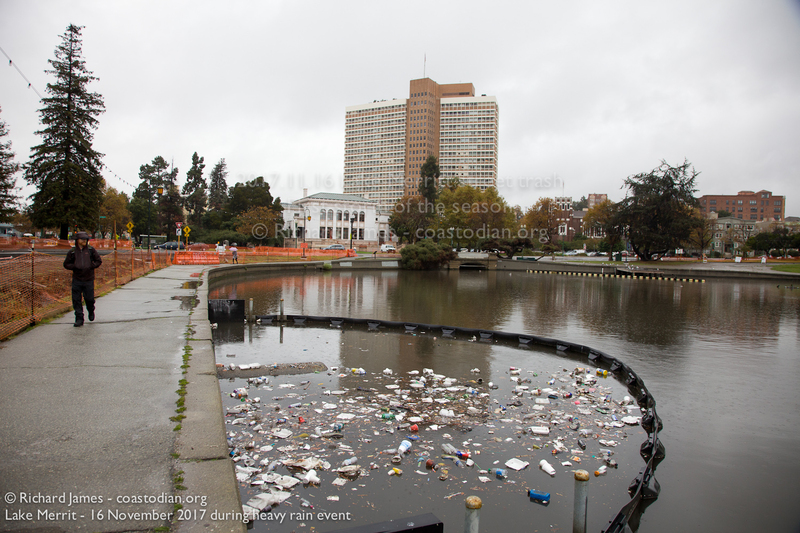 Maybe TOTUS (Twit Of The United States) has some answers on how to make Lake Merritt fabulous again? 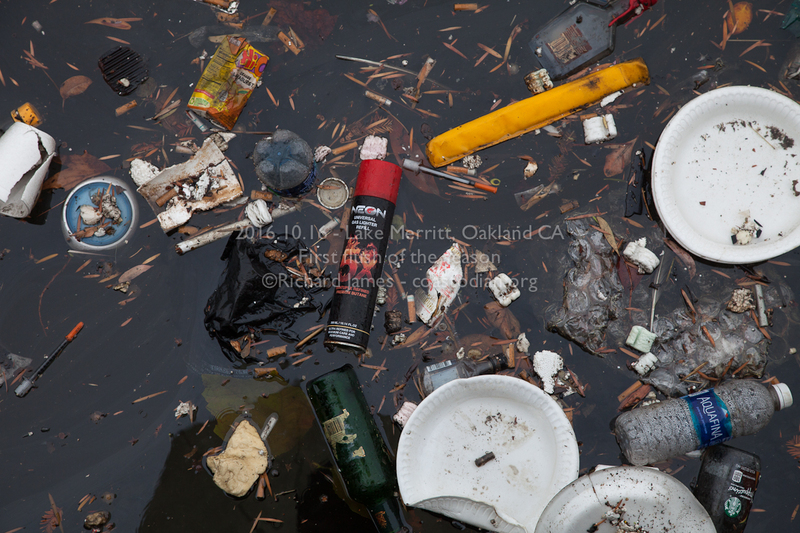 Sure glad Tomales Bay looks nothing like this.